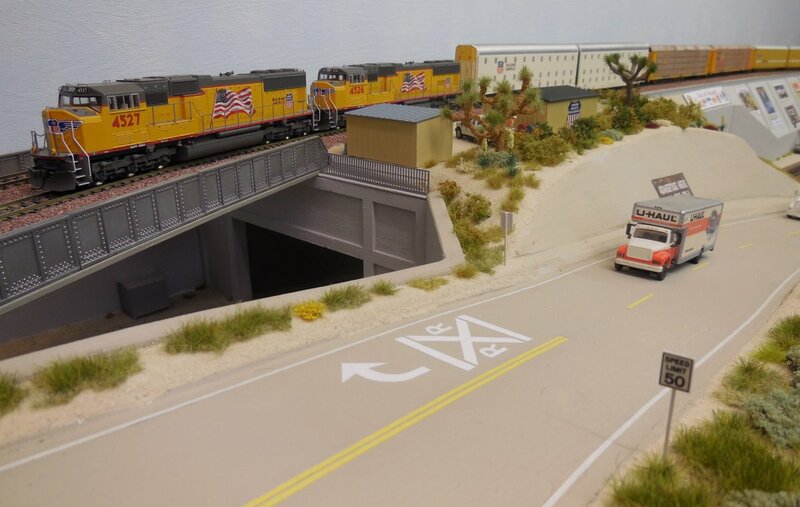 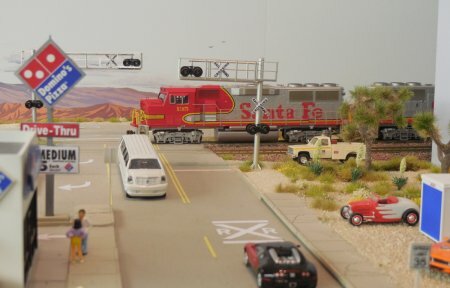 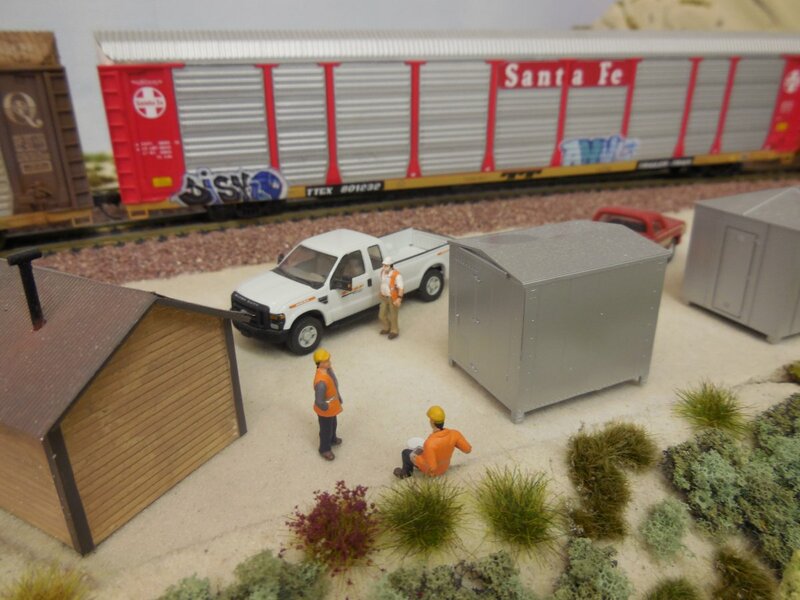 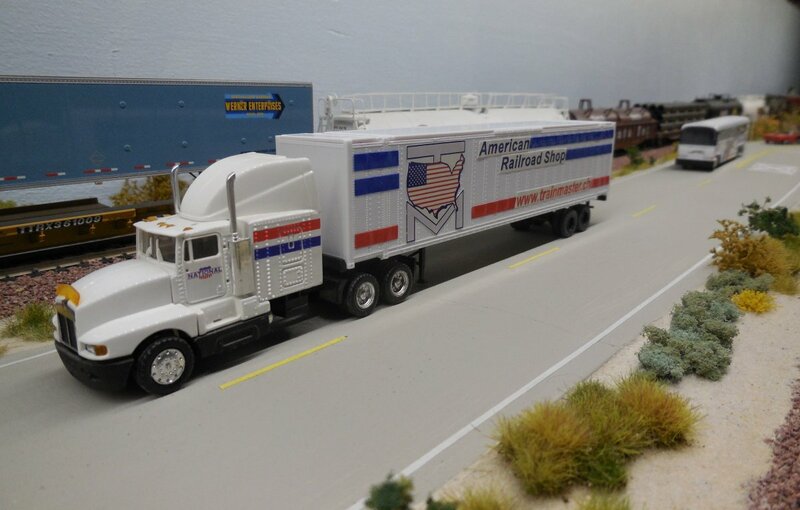 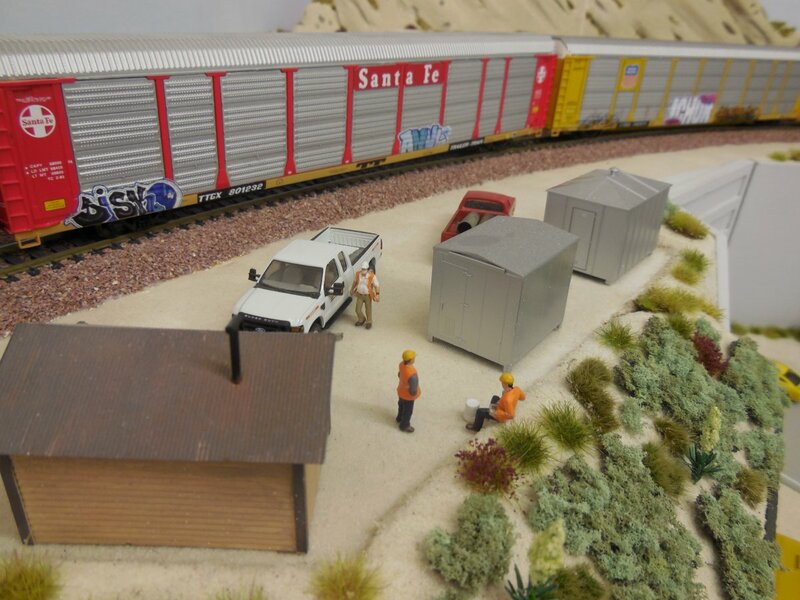 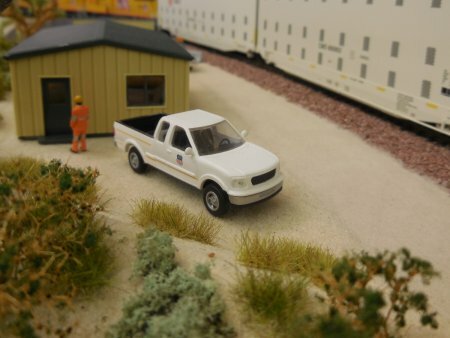 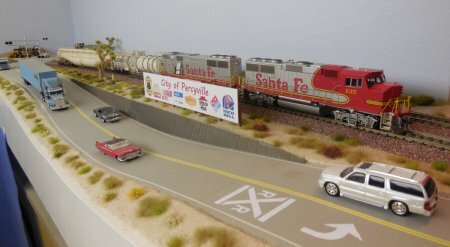 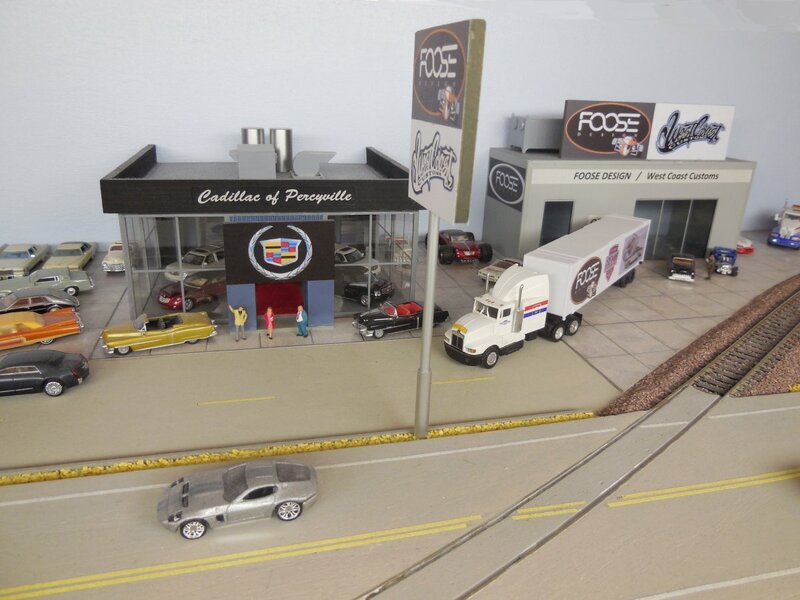 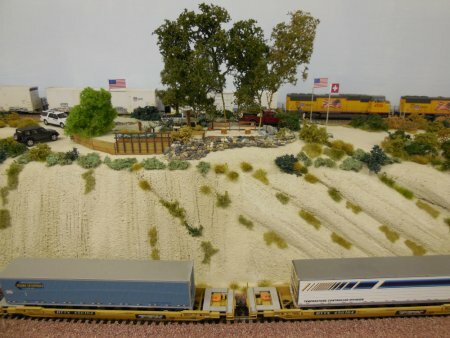 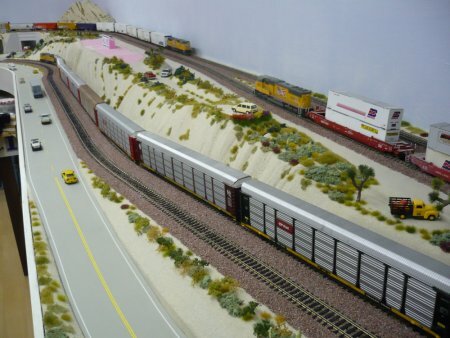 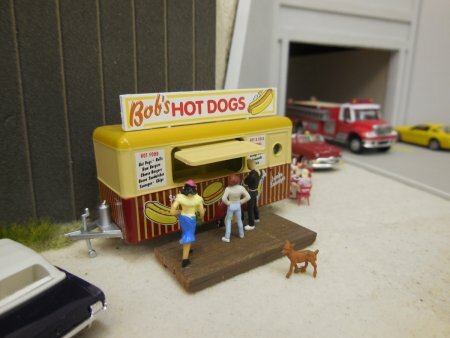 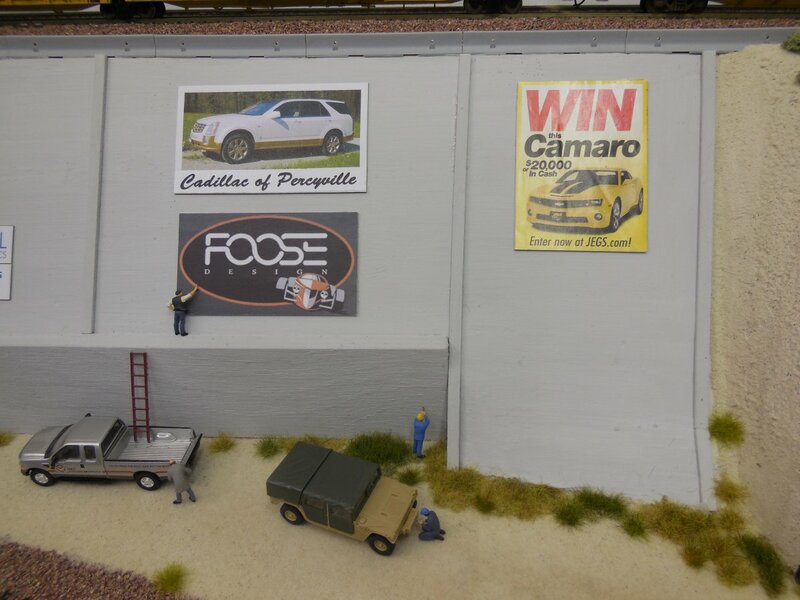 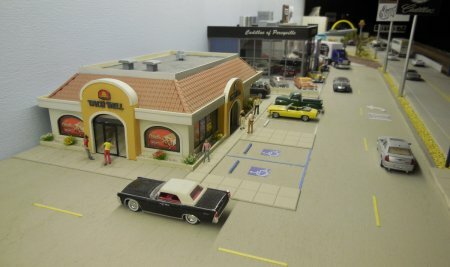 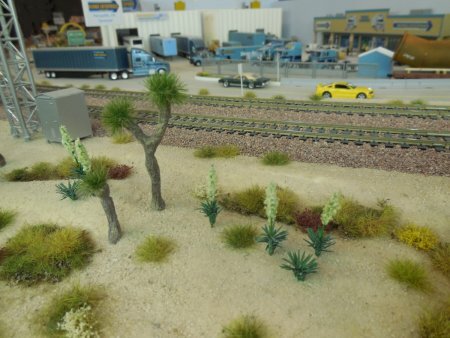 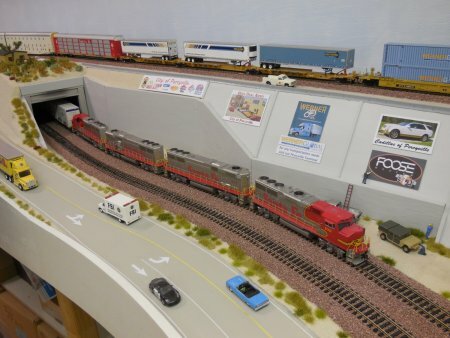 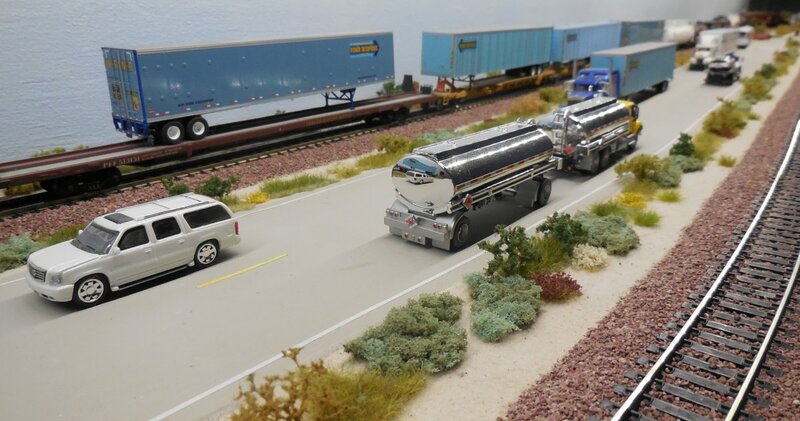 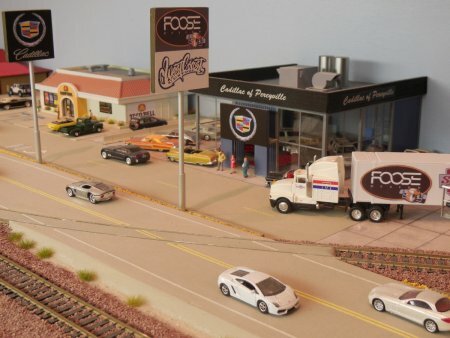 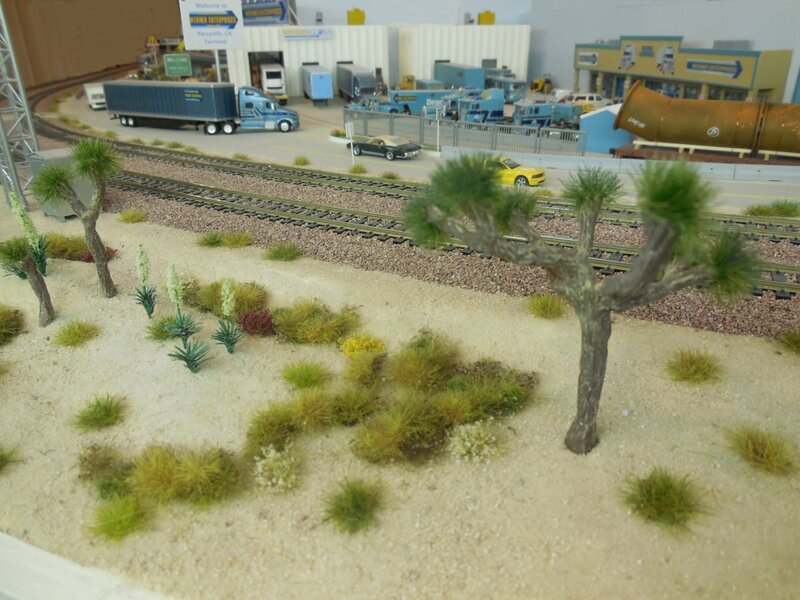 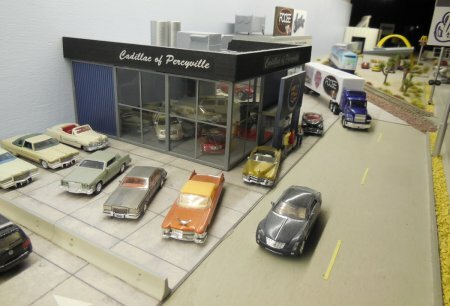 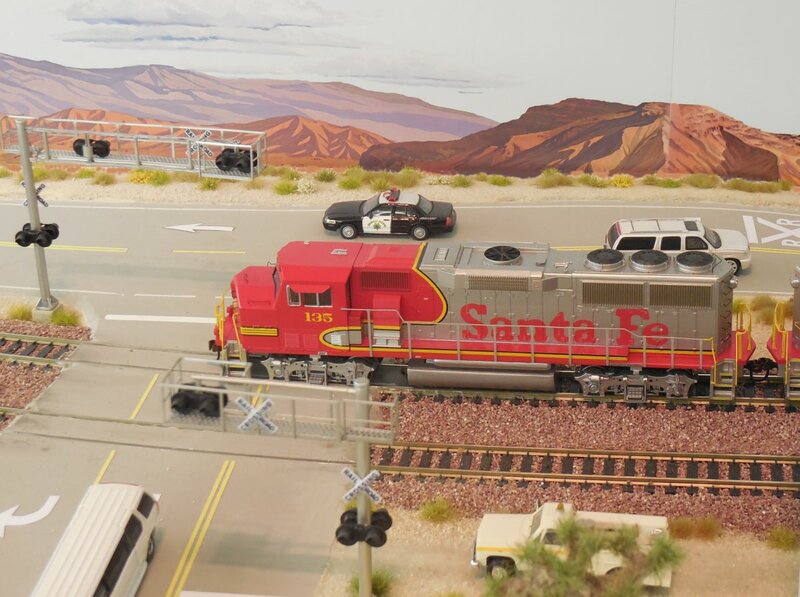 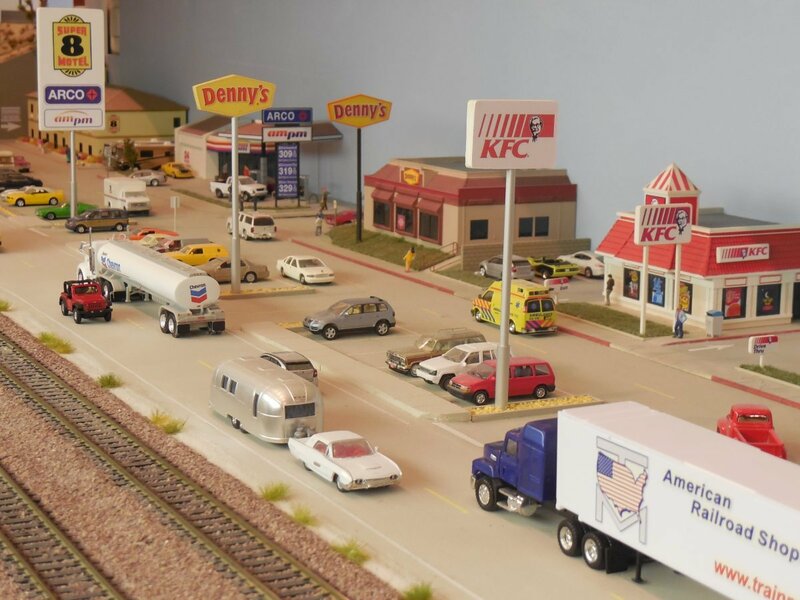 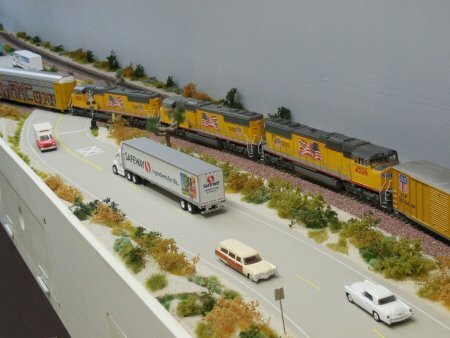 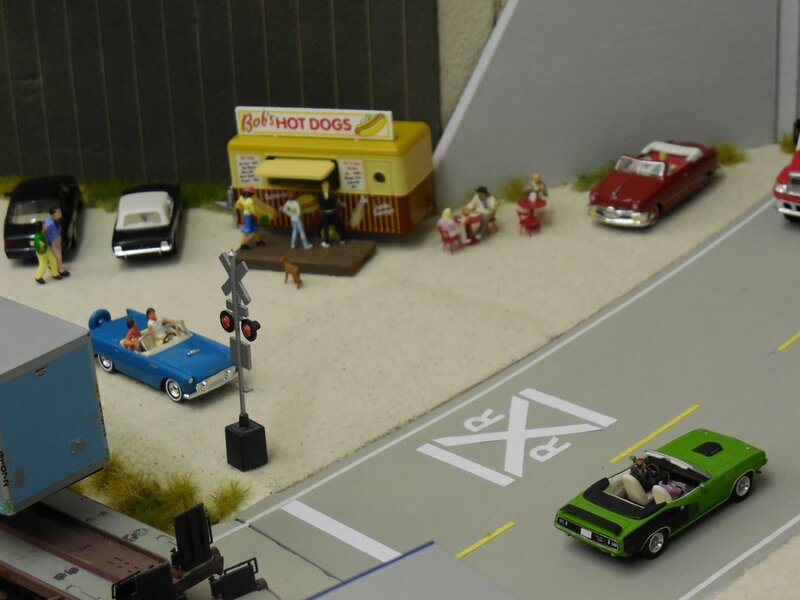 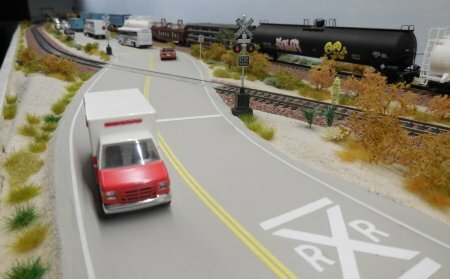 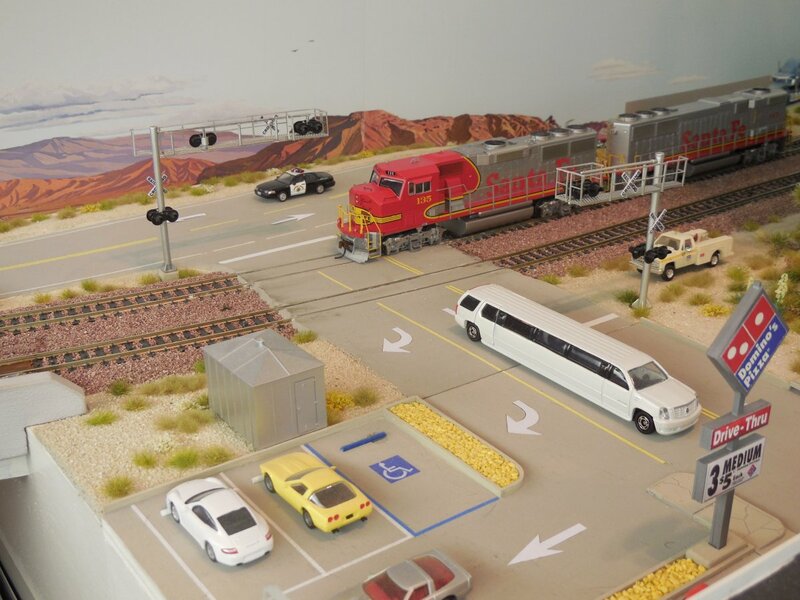 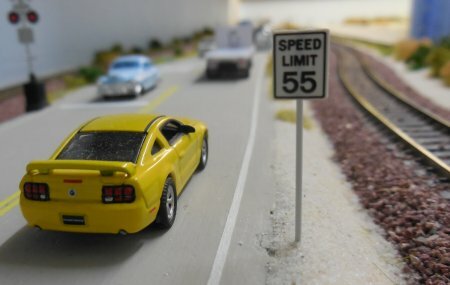 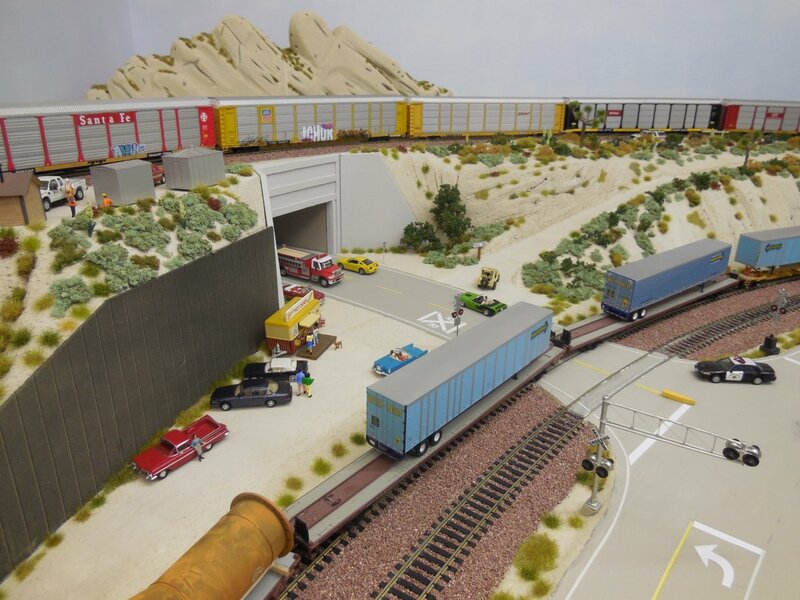 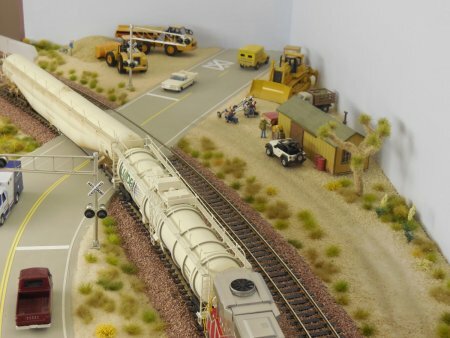 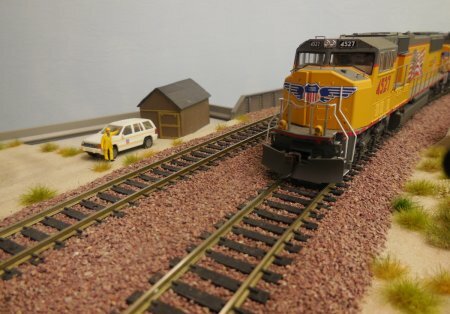 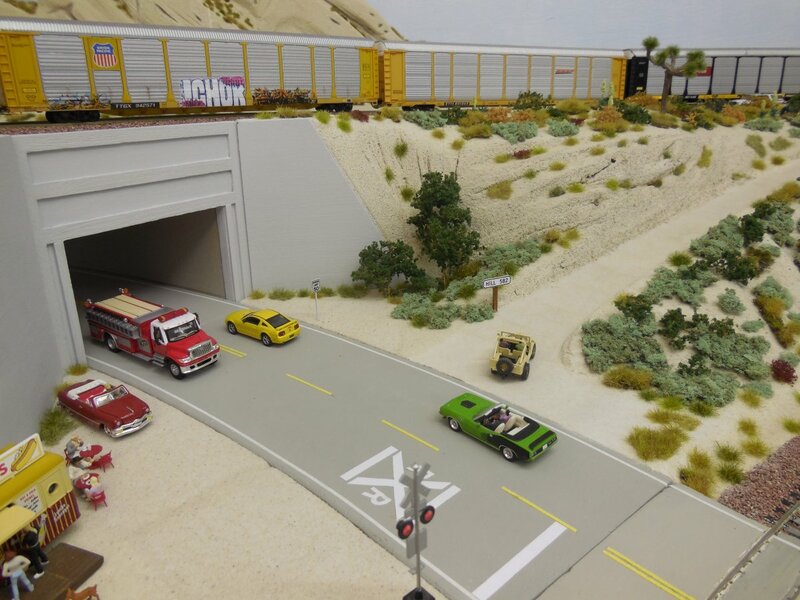 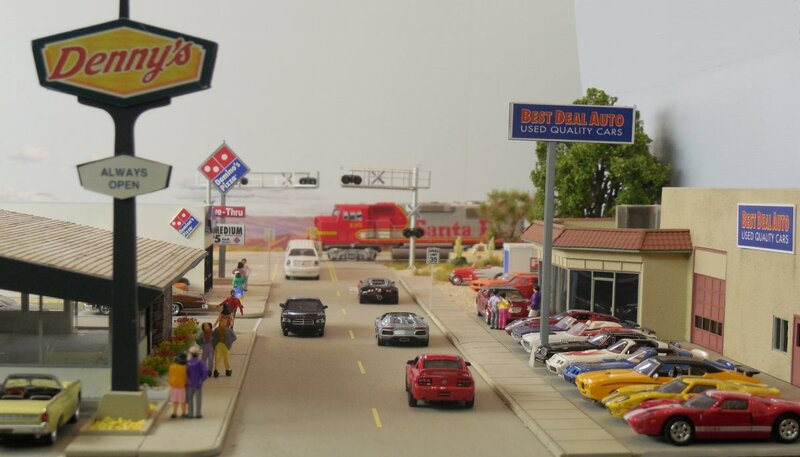 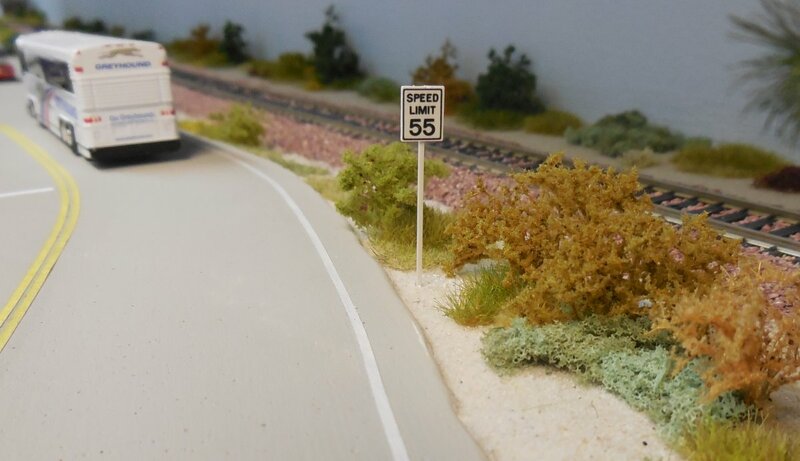 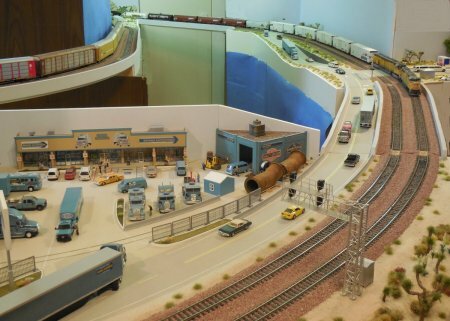 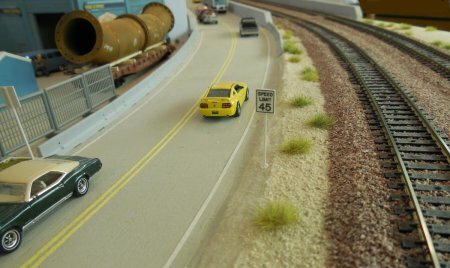 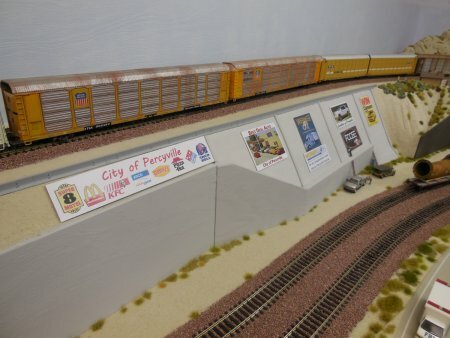 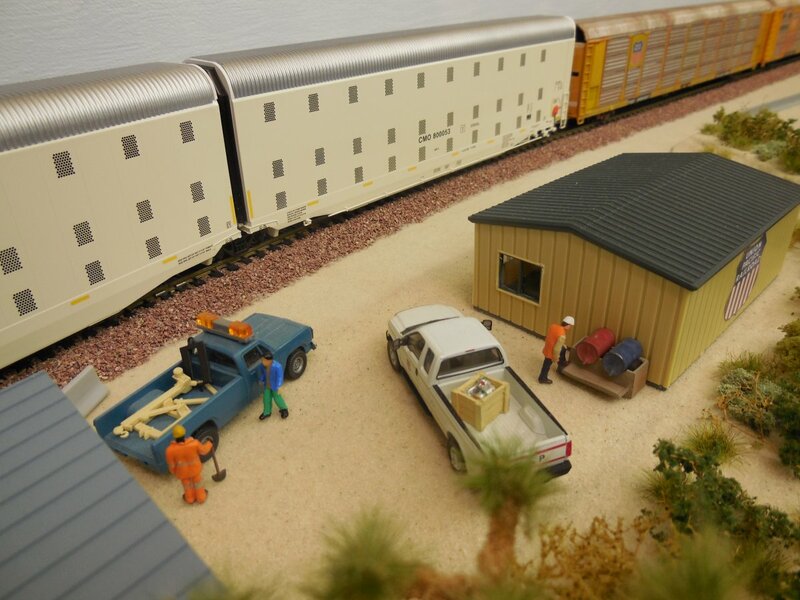 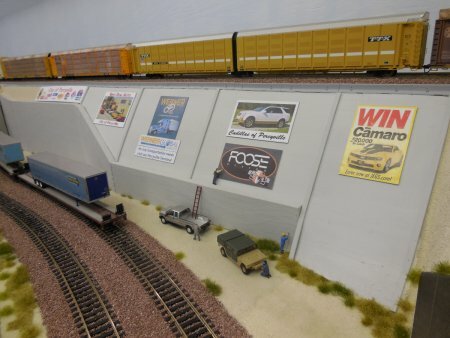 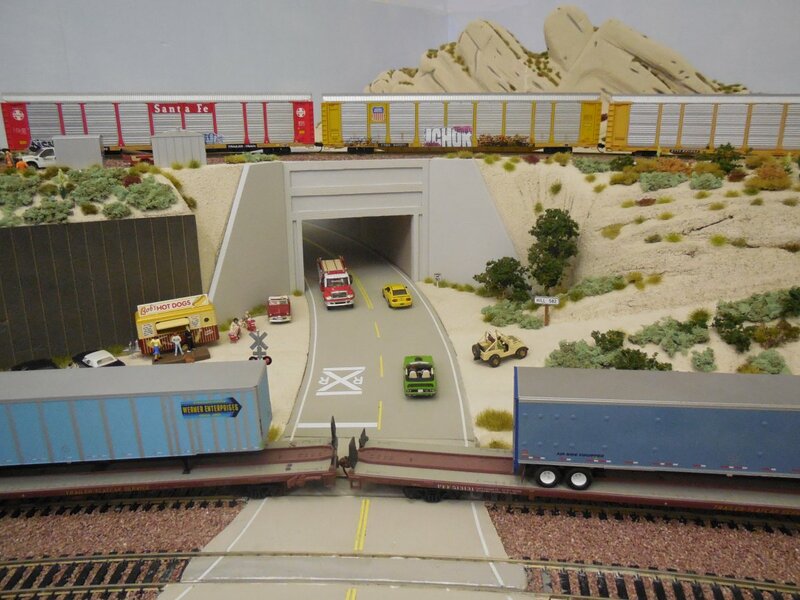 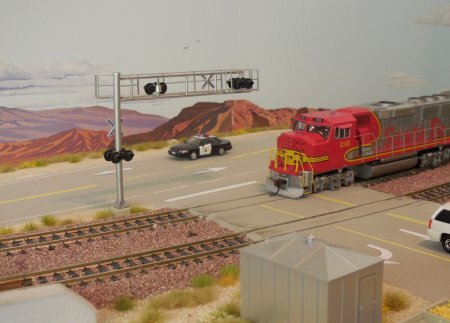 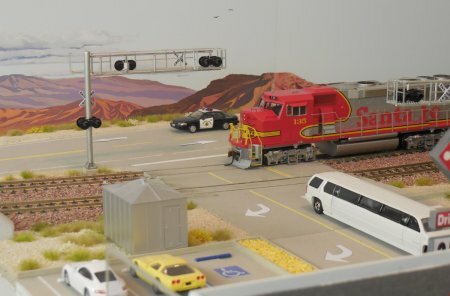 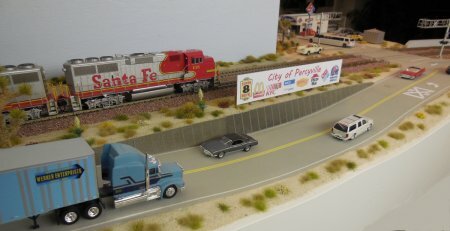 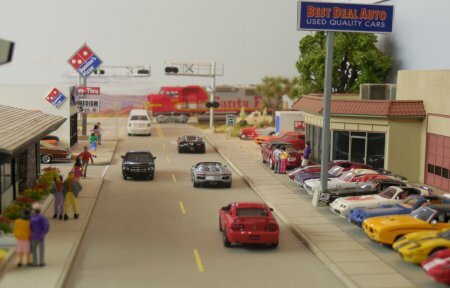 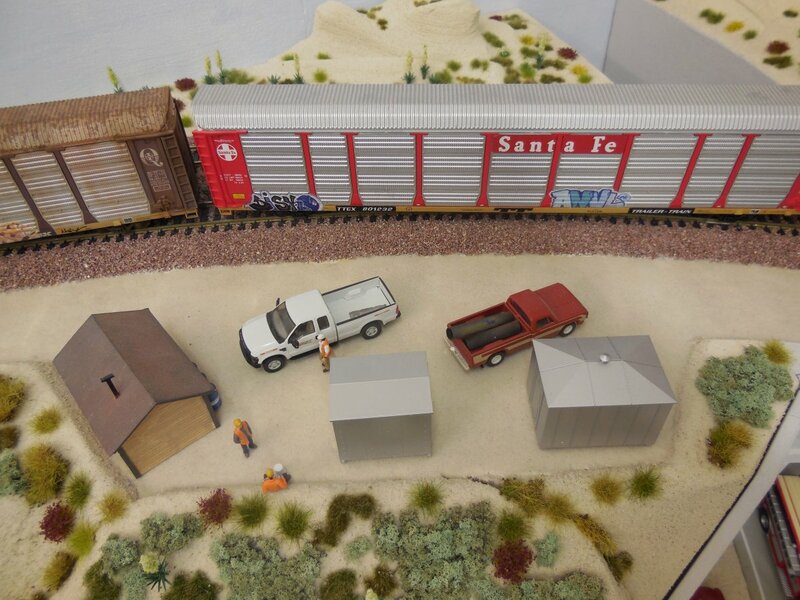 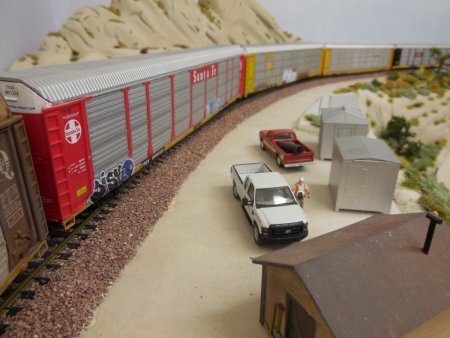 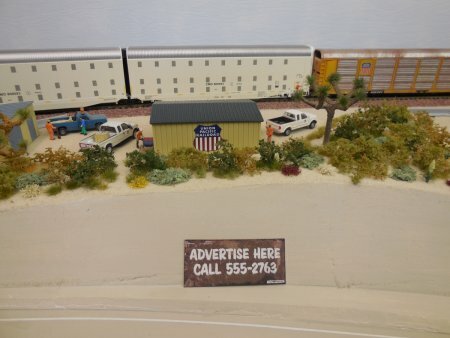 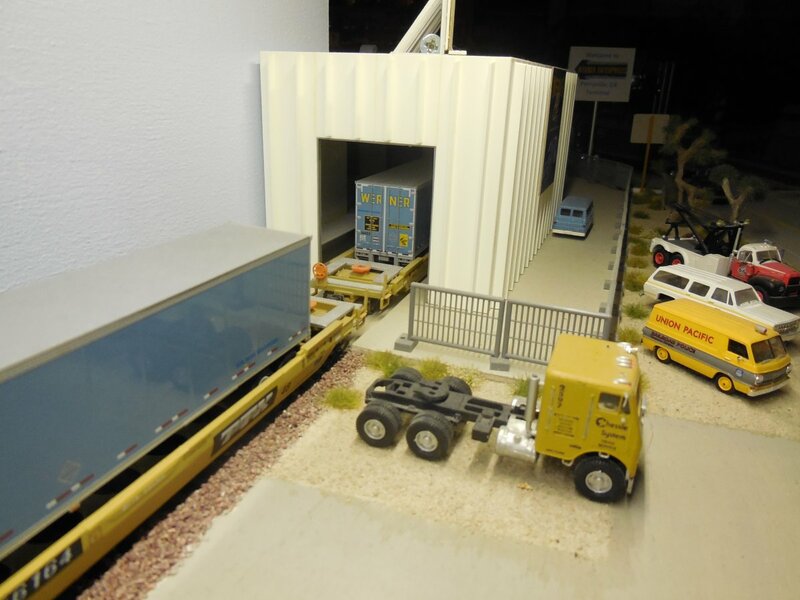 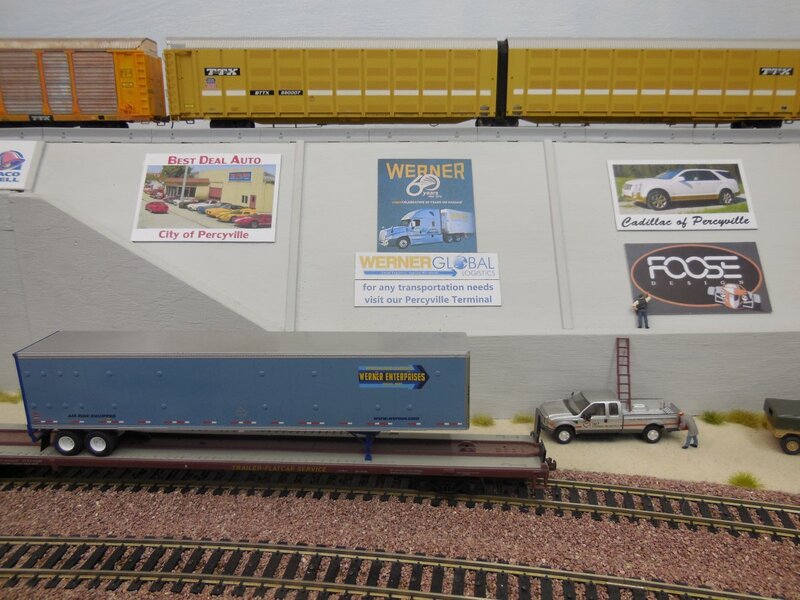 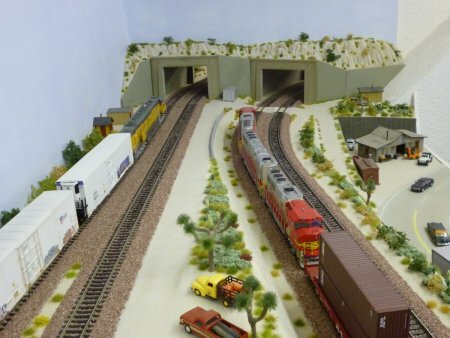 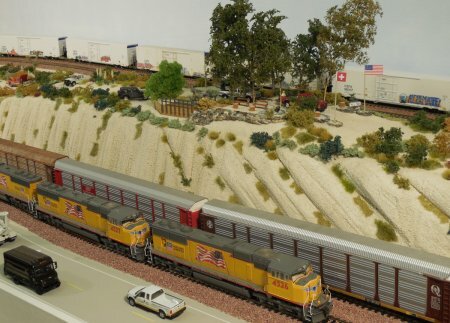 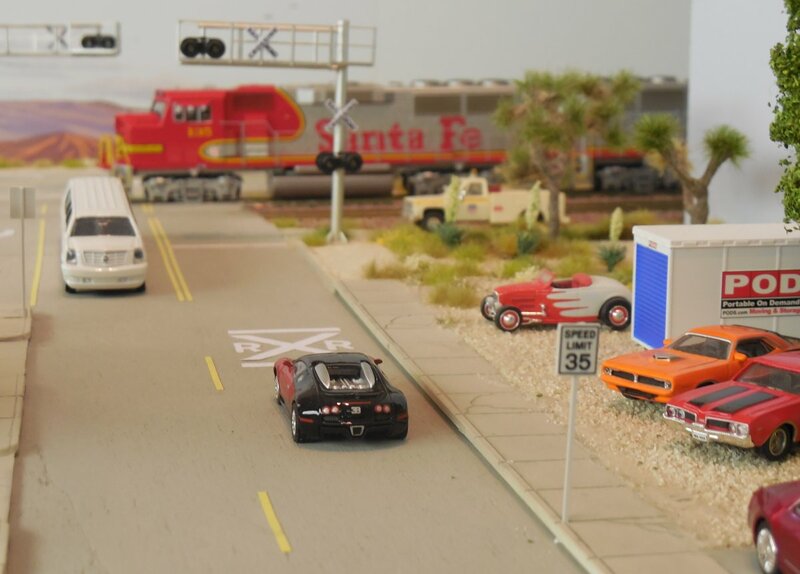 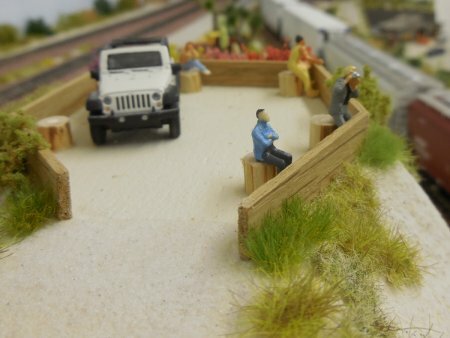 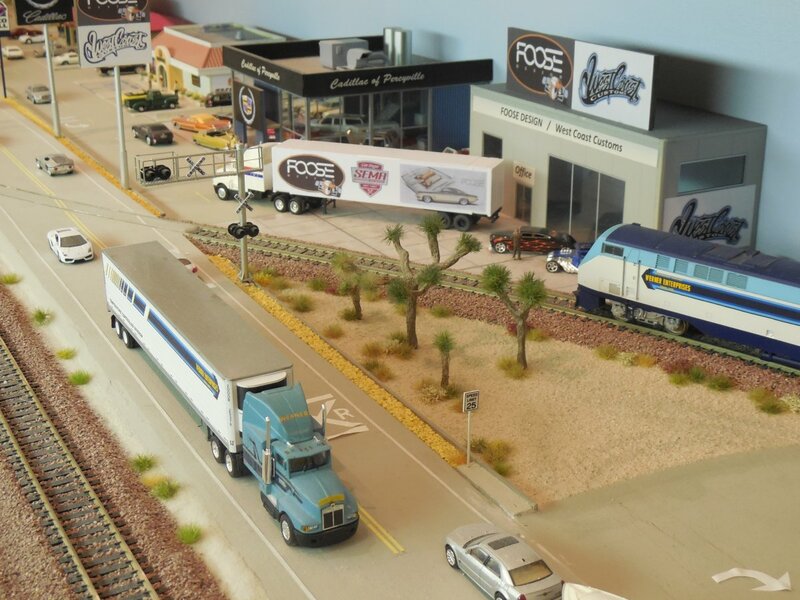 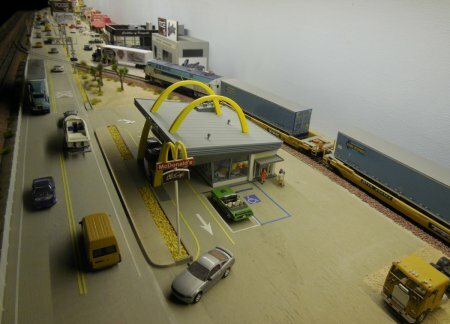 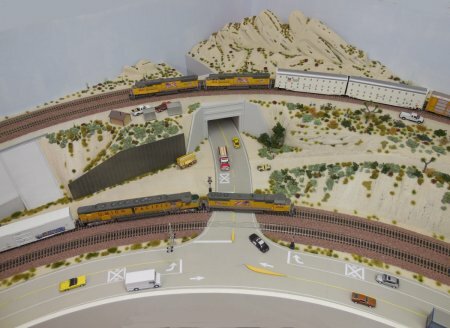 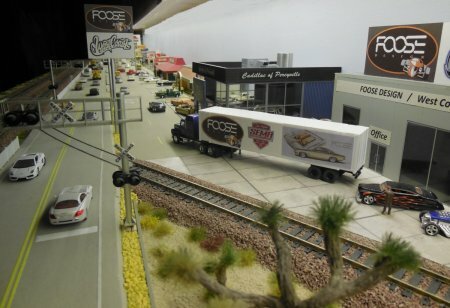 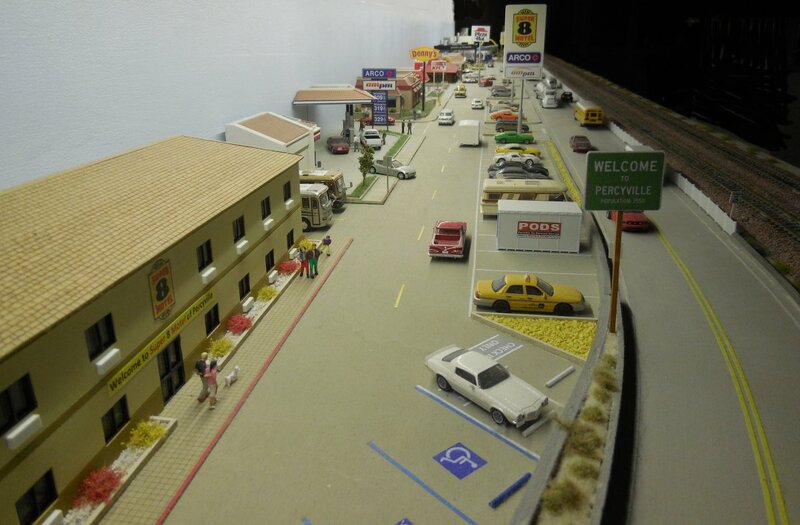 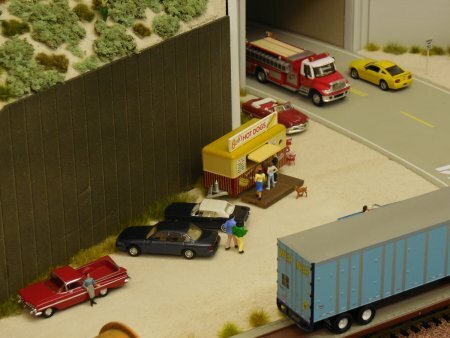 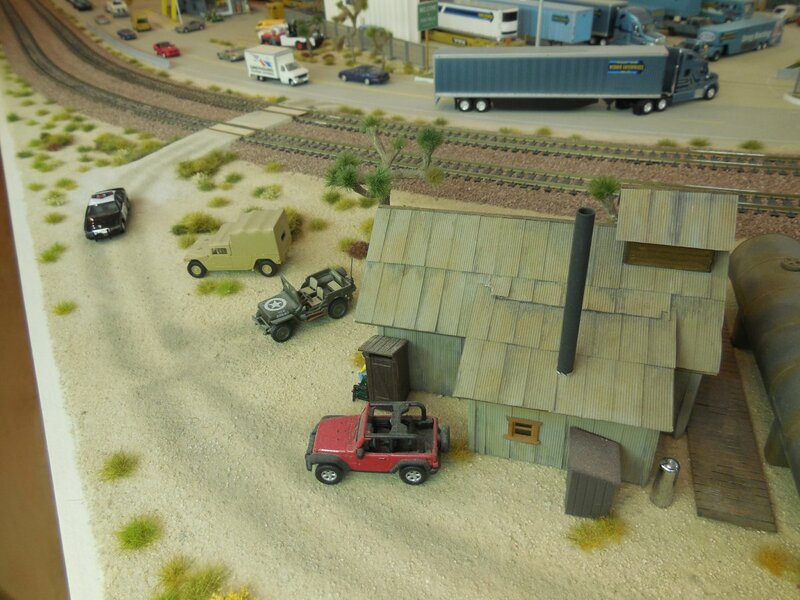 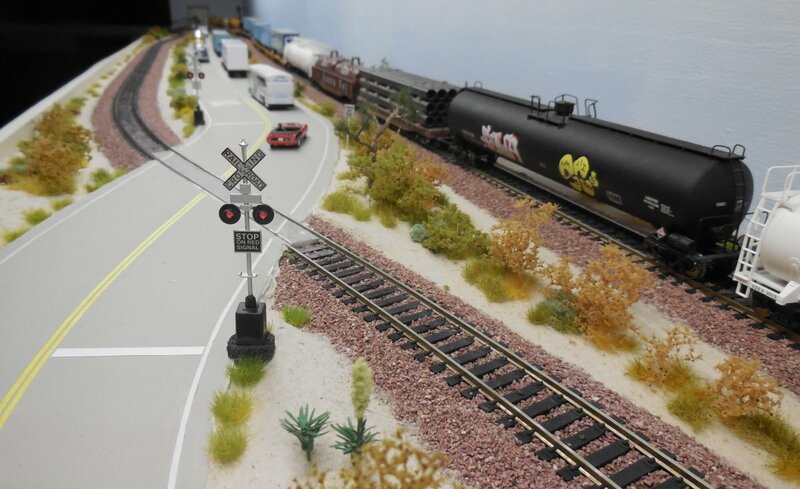 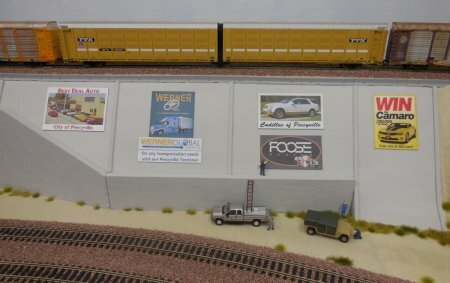 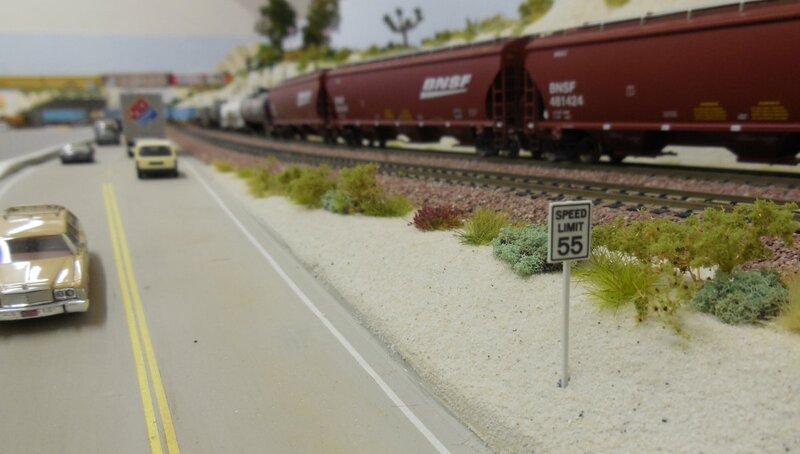 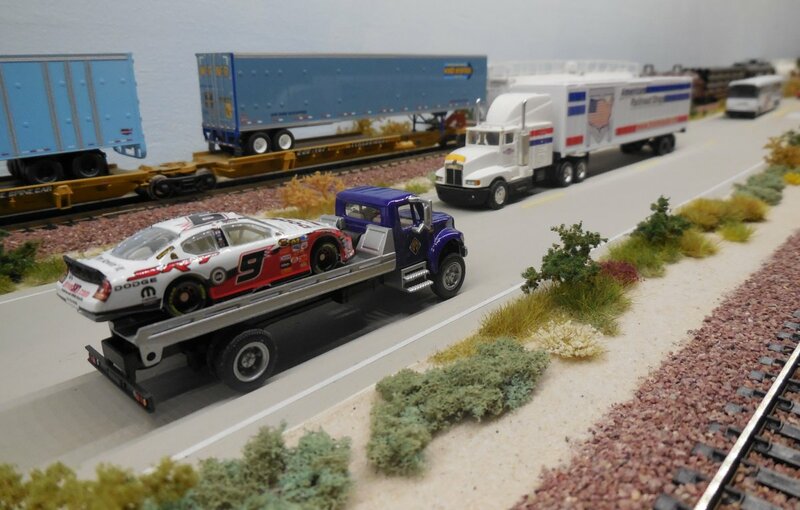 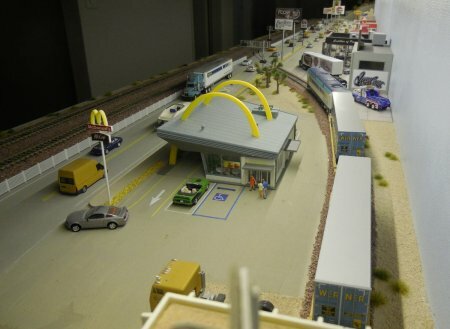 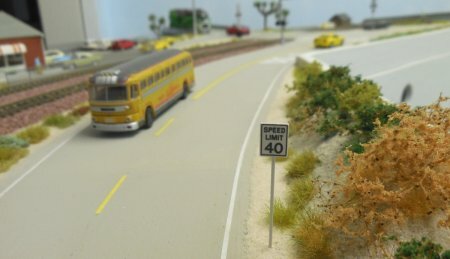 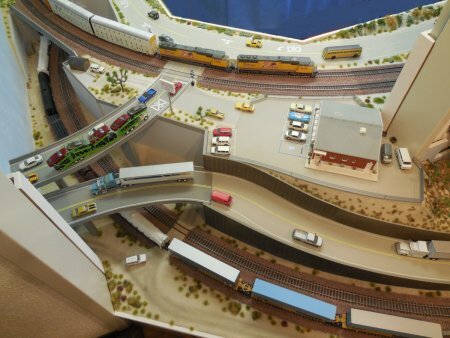 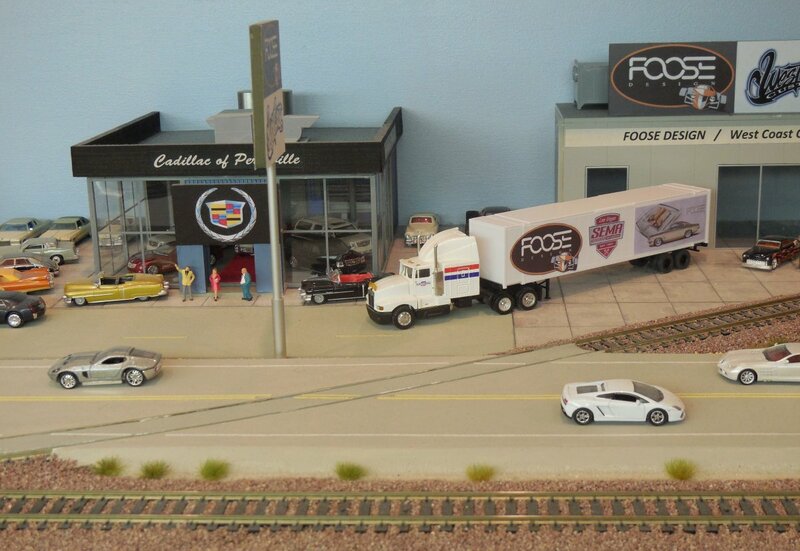 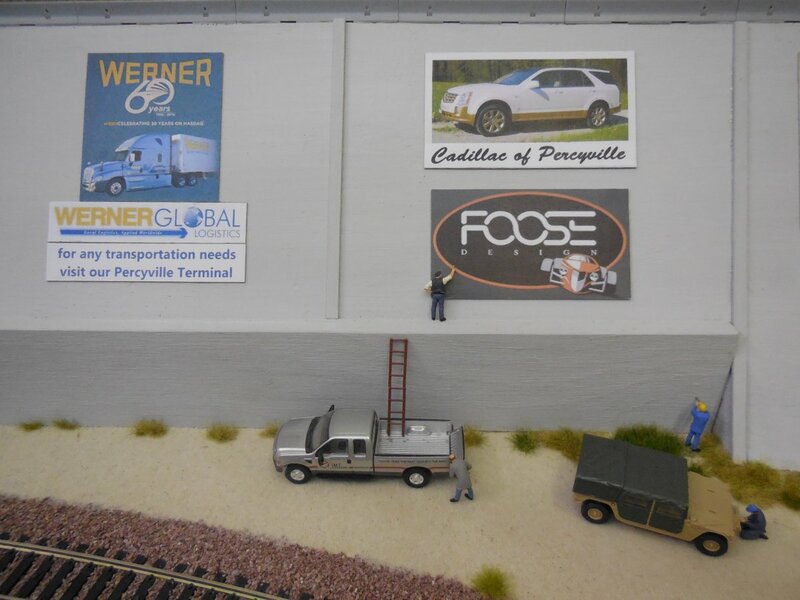 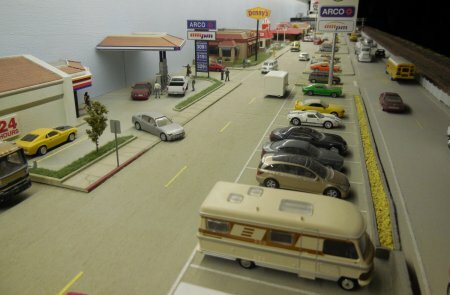 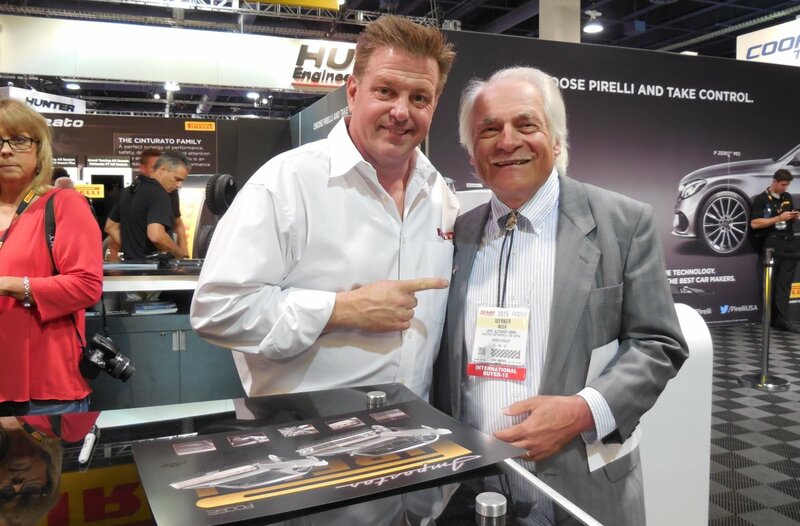 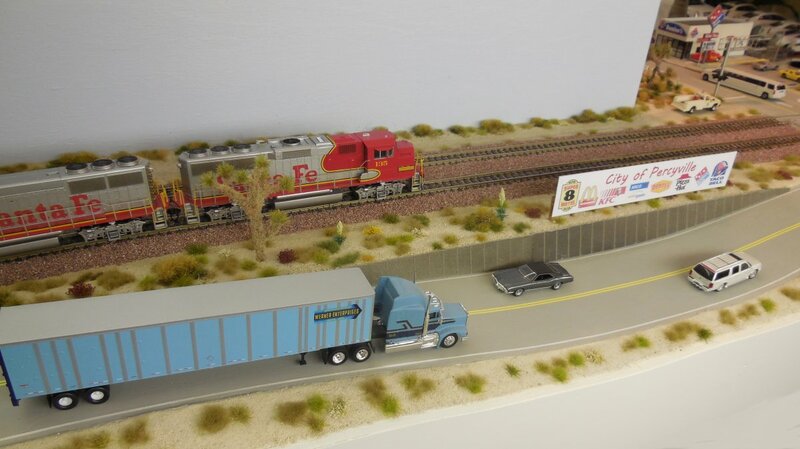 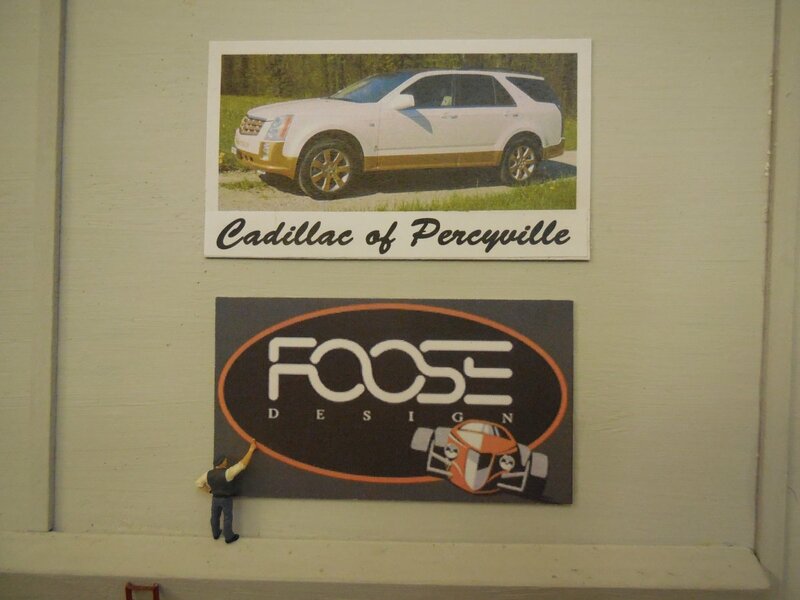 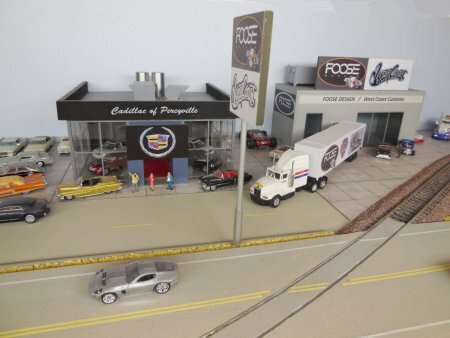 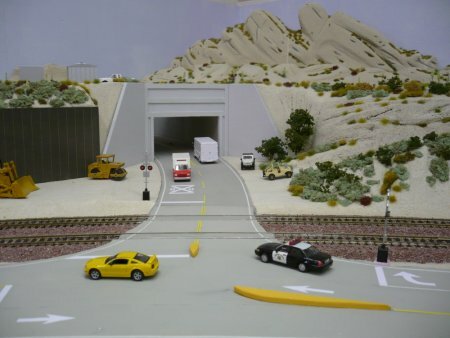 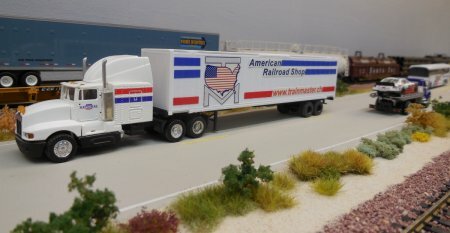 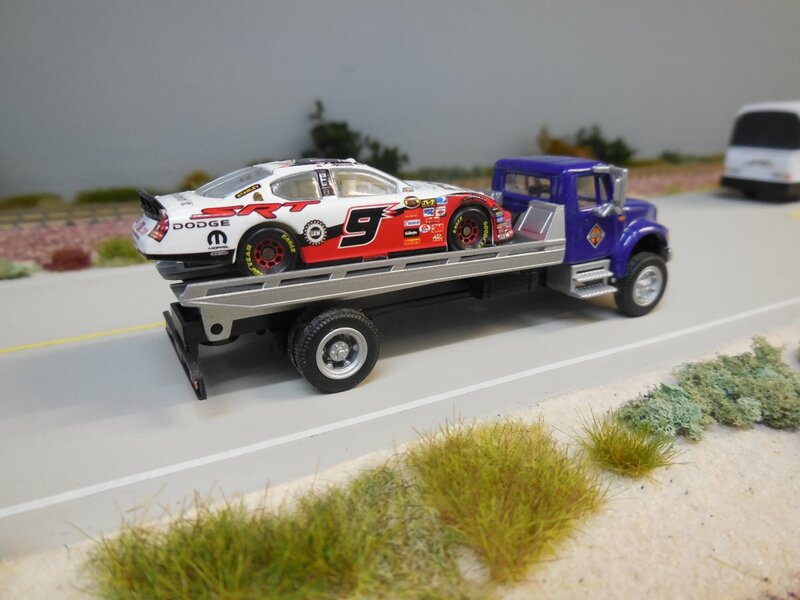 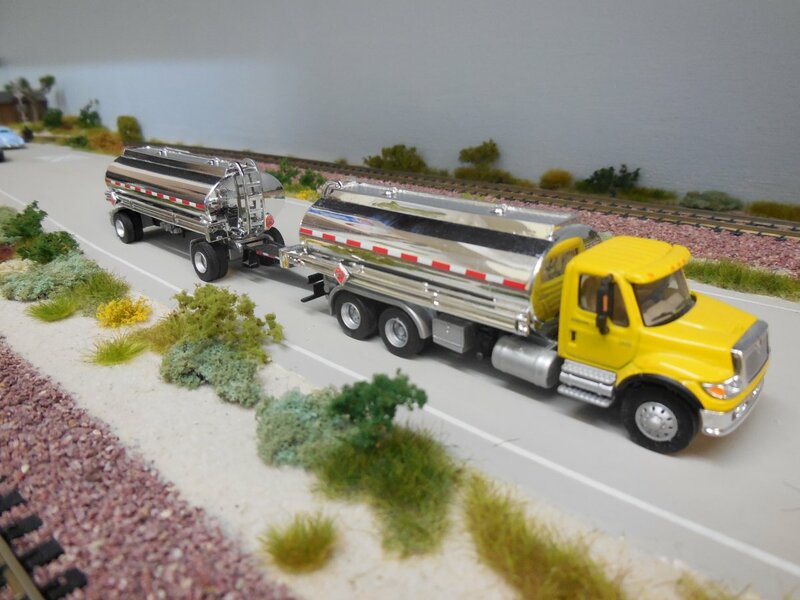 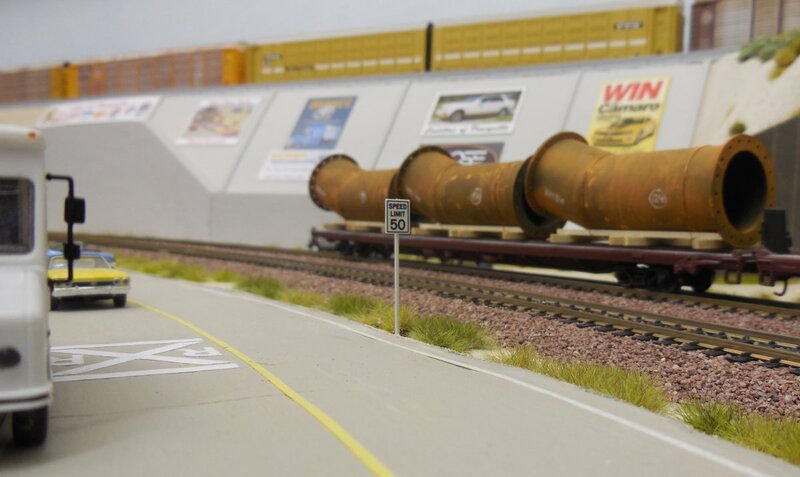 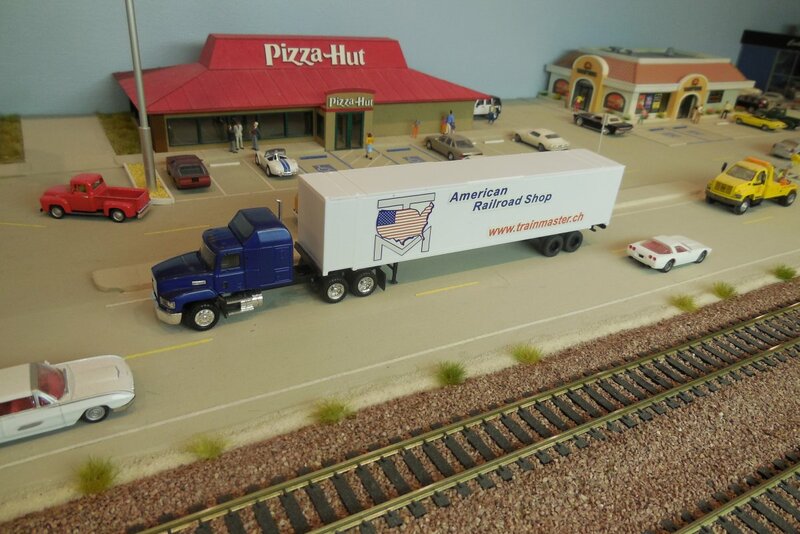 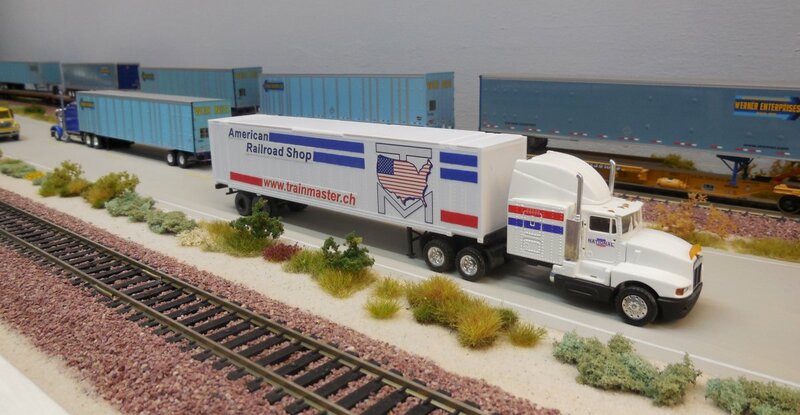 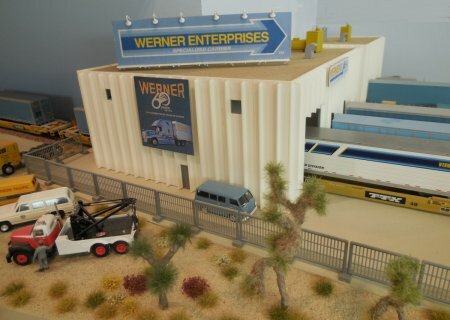 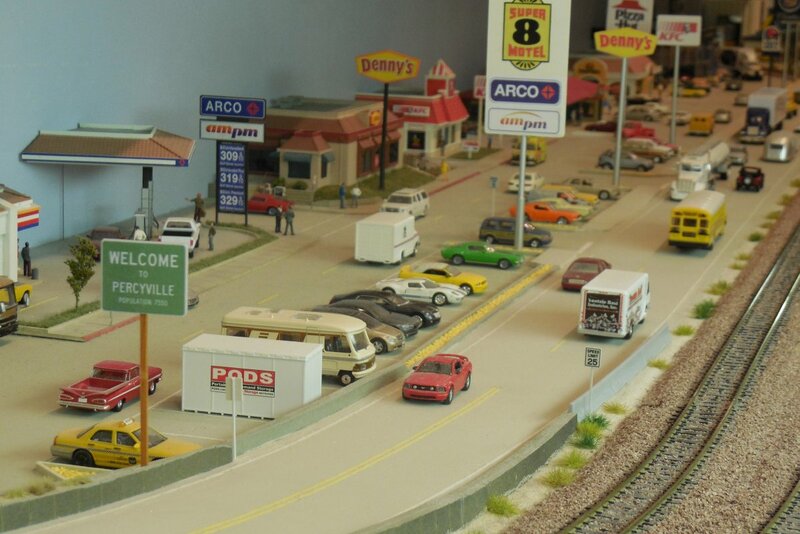 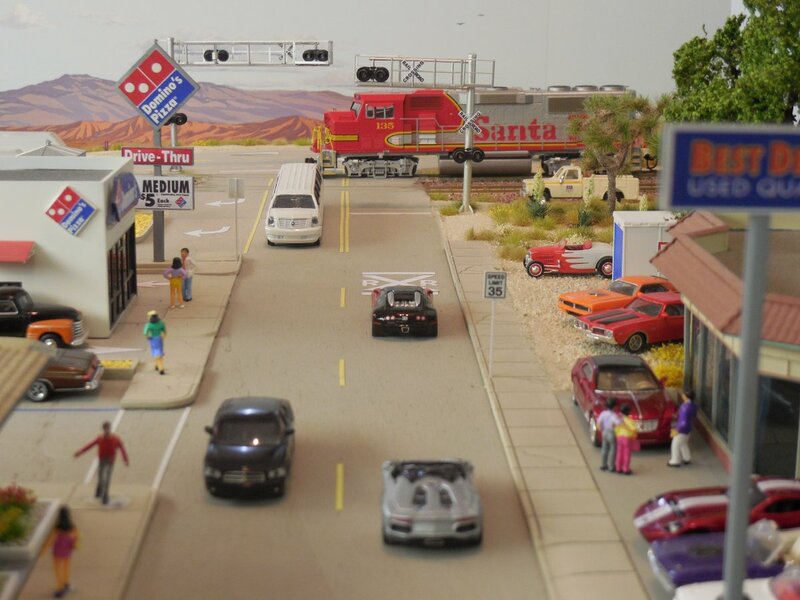 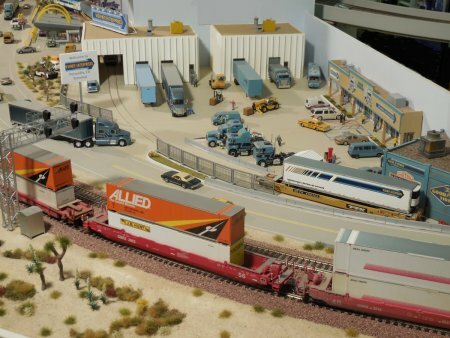 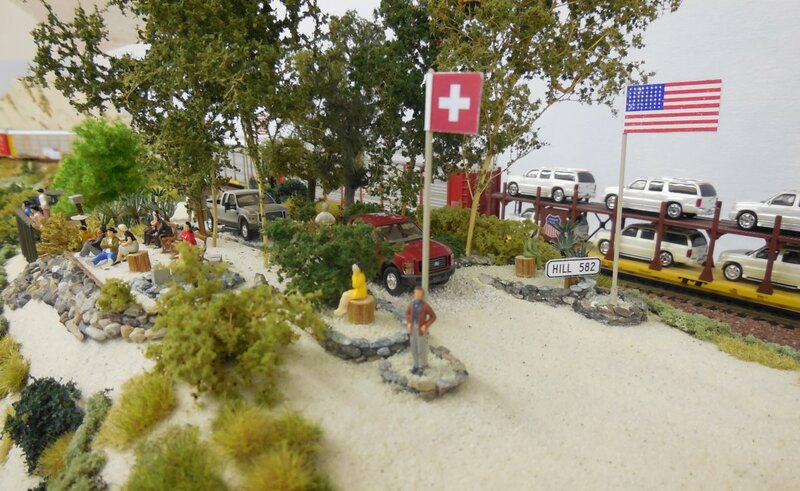 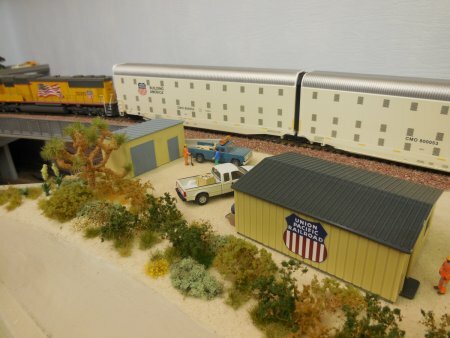 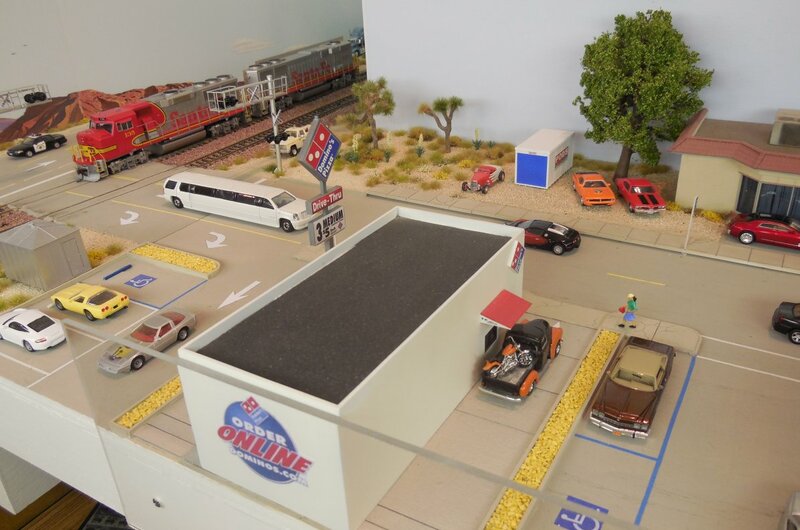 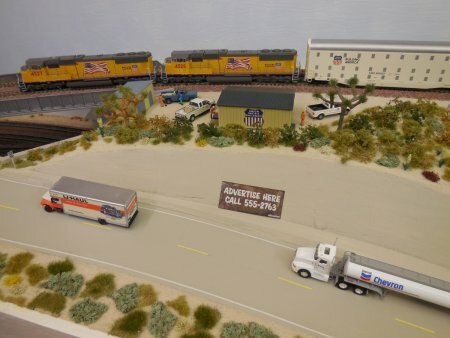 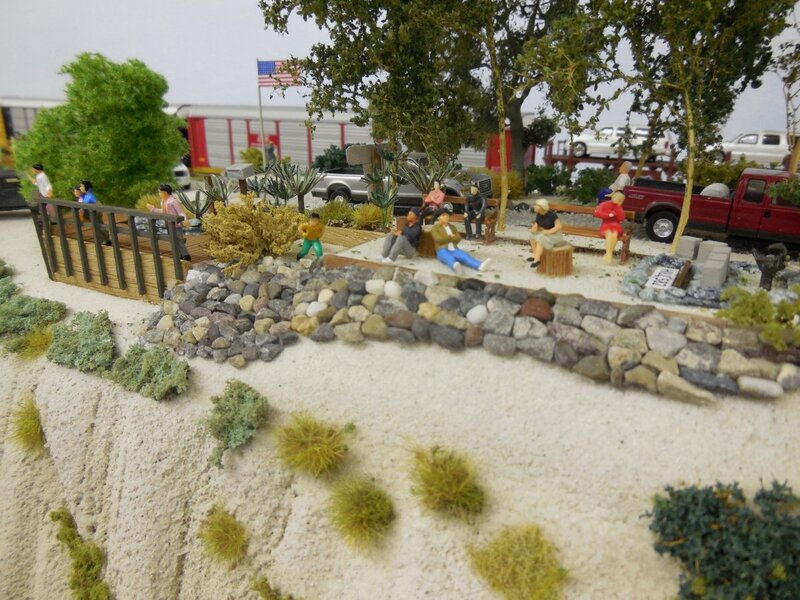 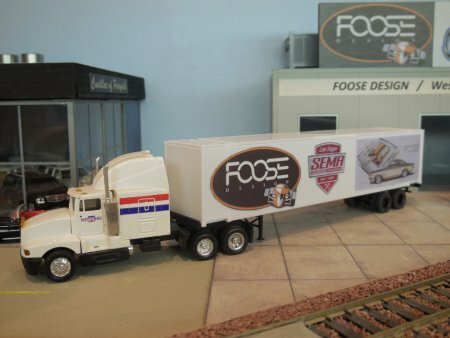 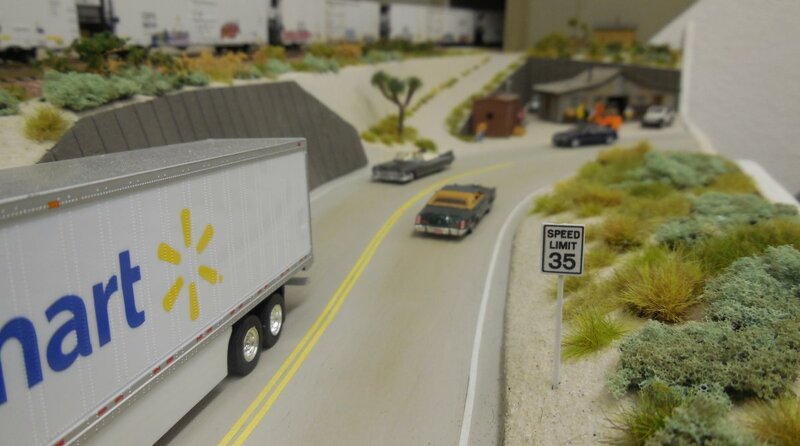 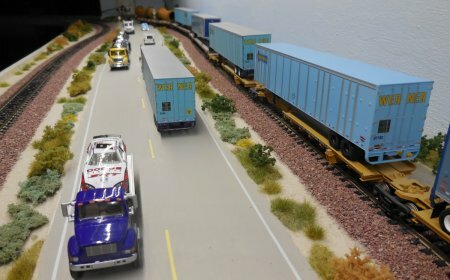 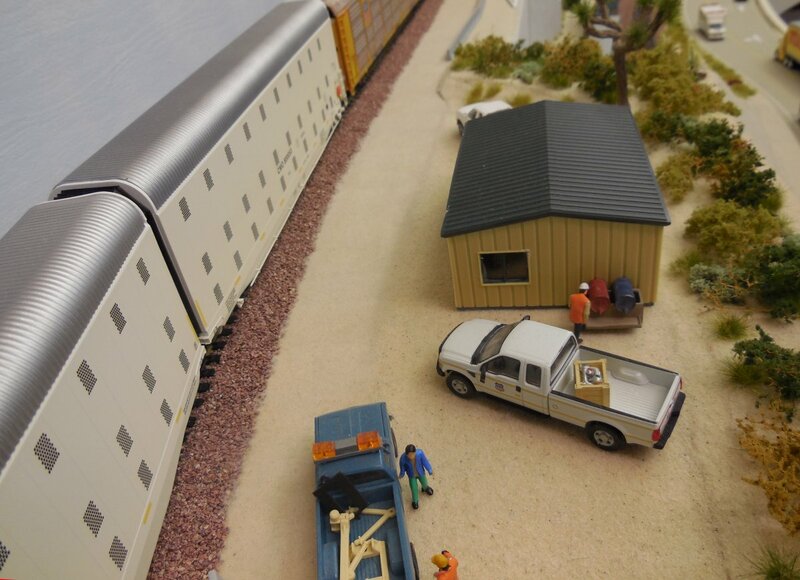 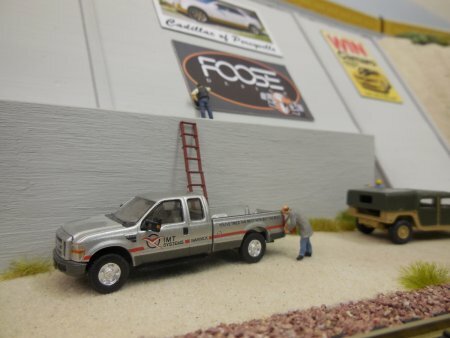 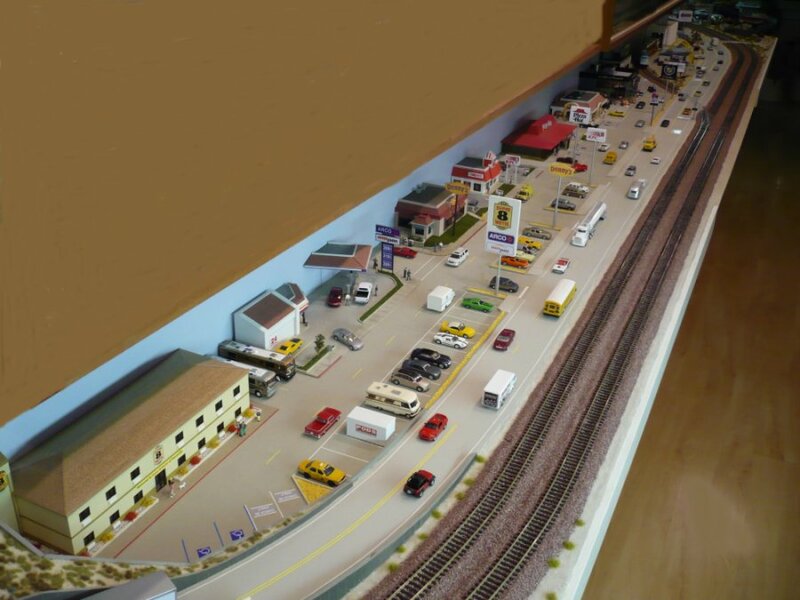 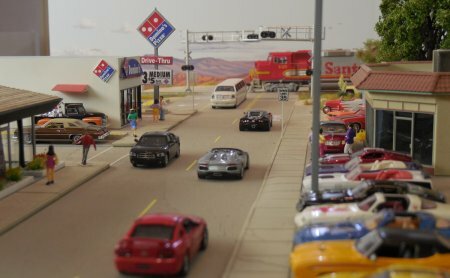 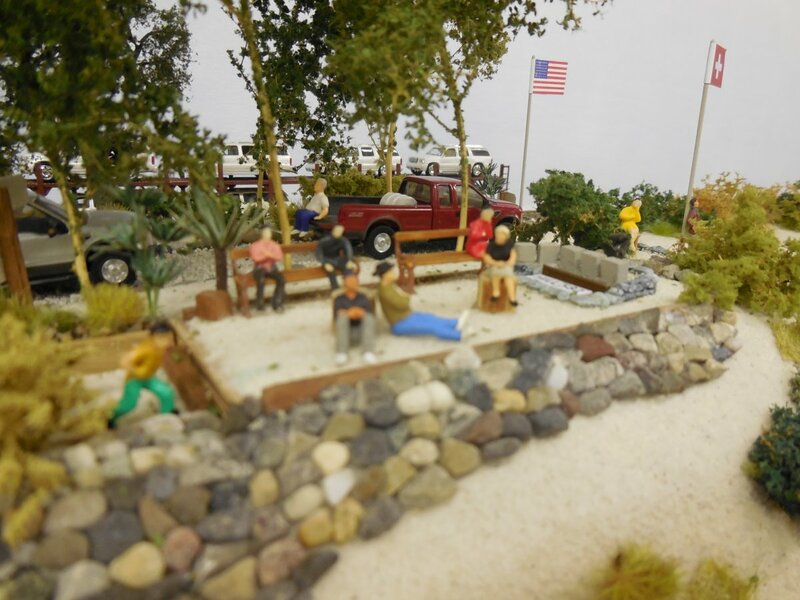 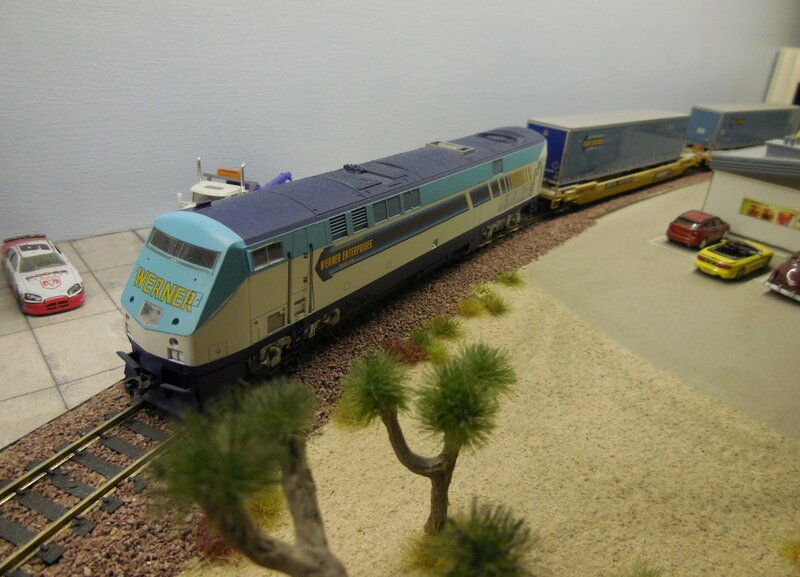 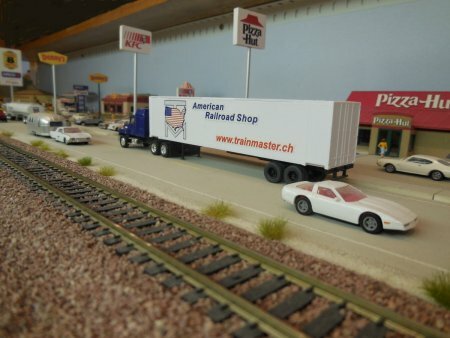 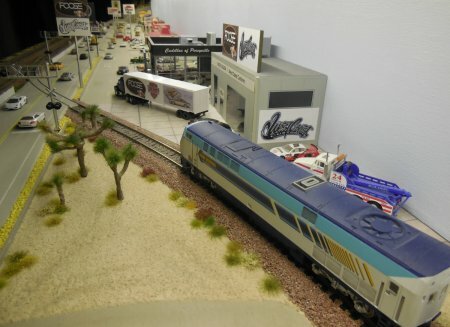 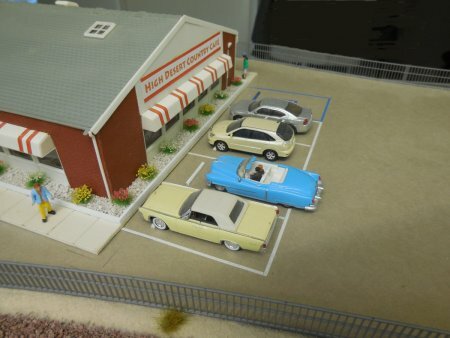 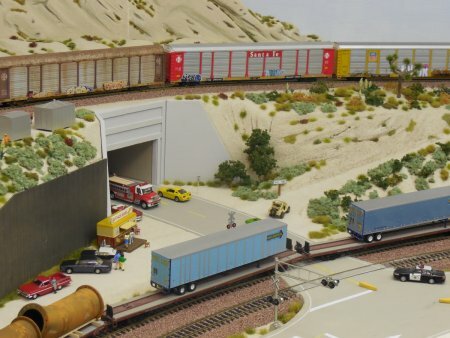 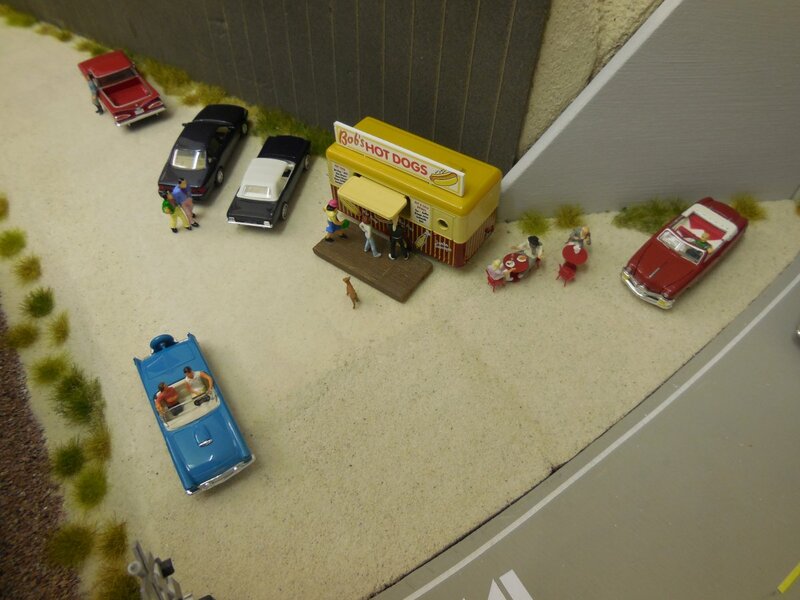 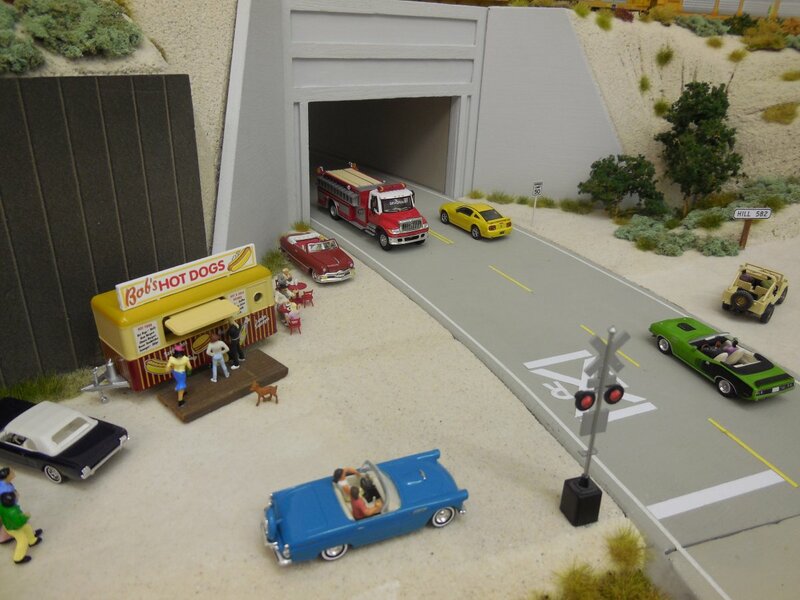 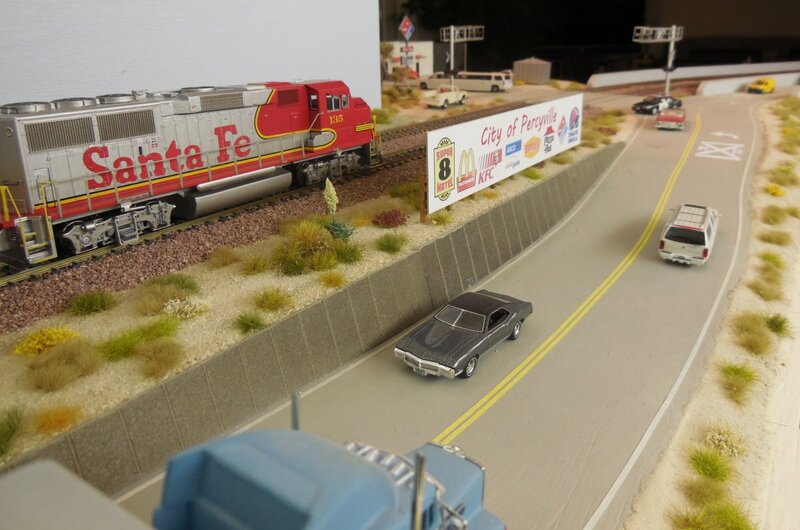 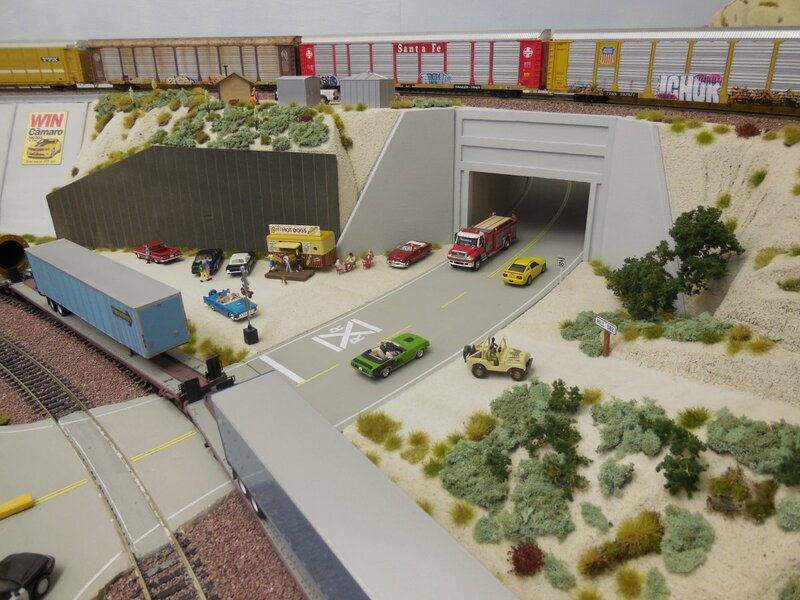 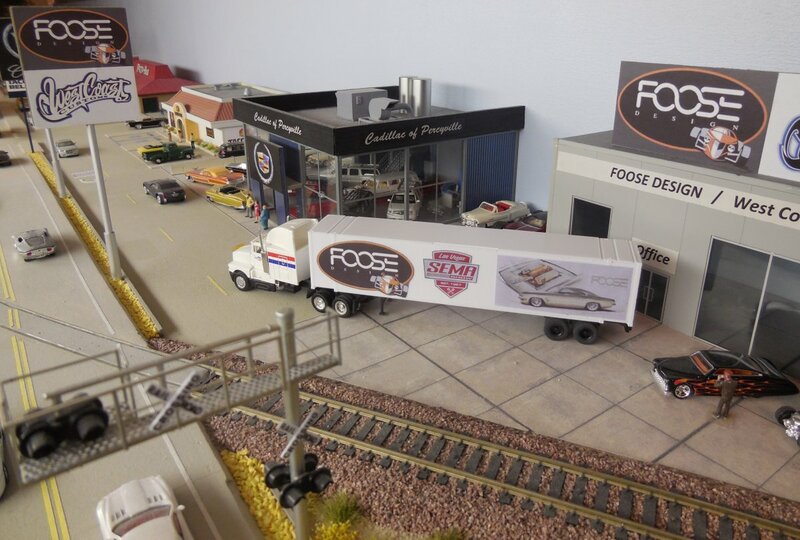 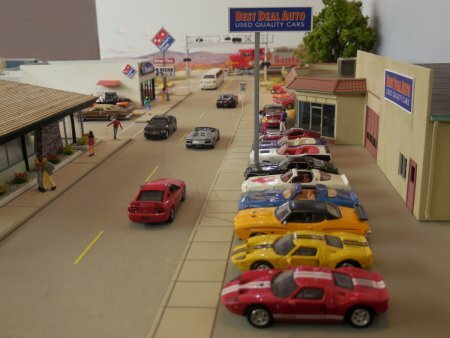 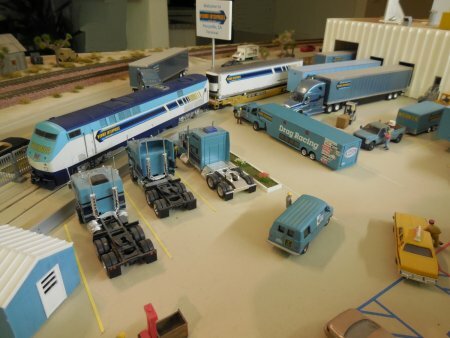 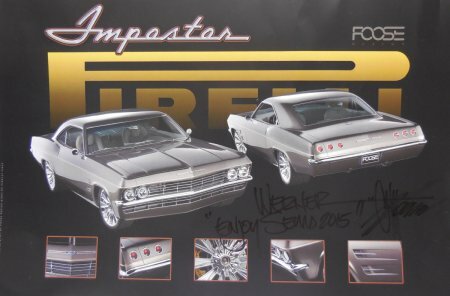 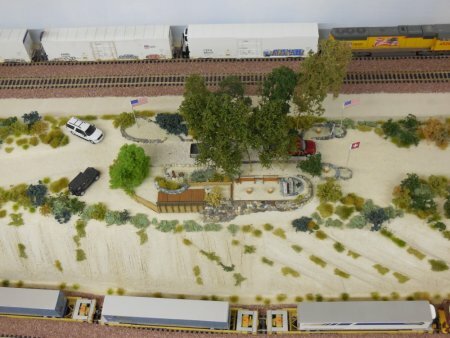 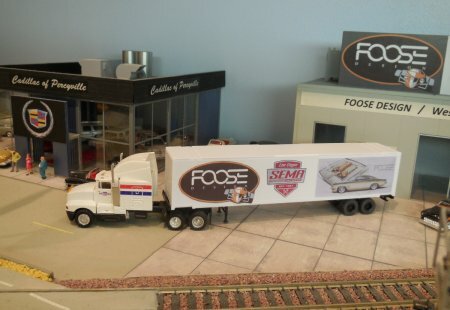 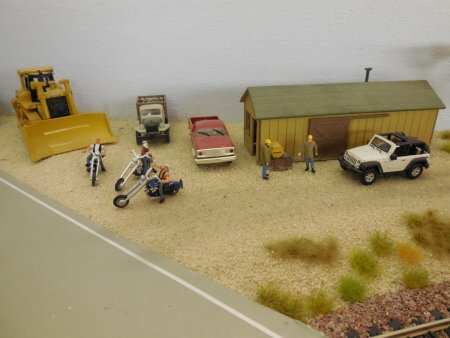 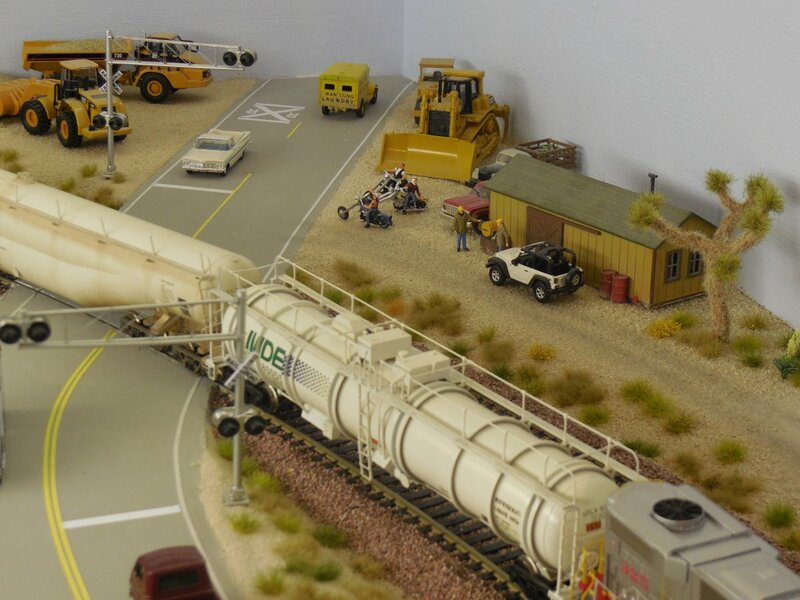 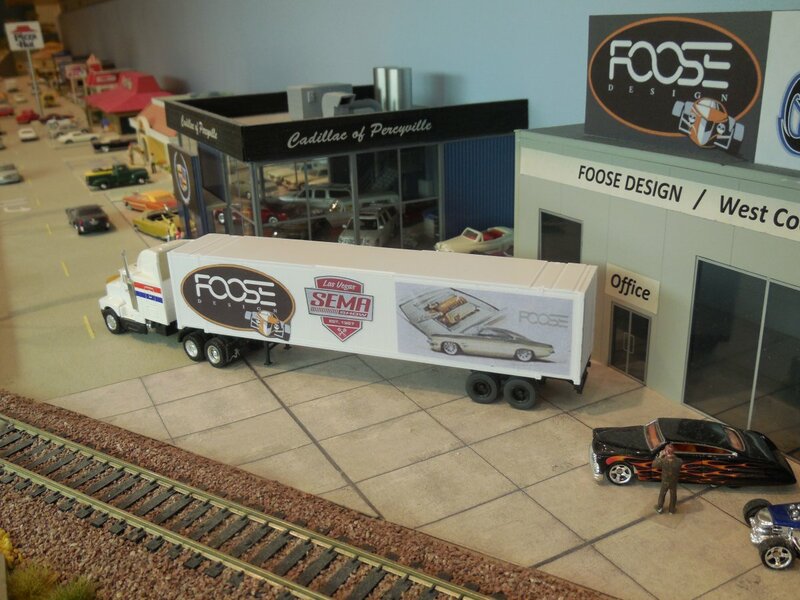 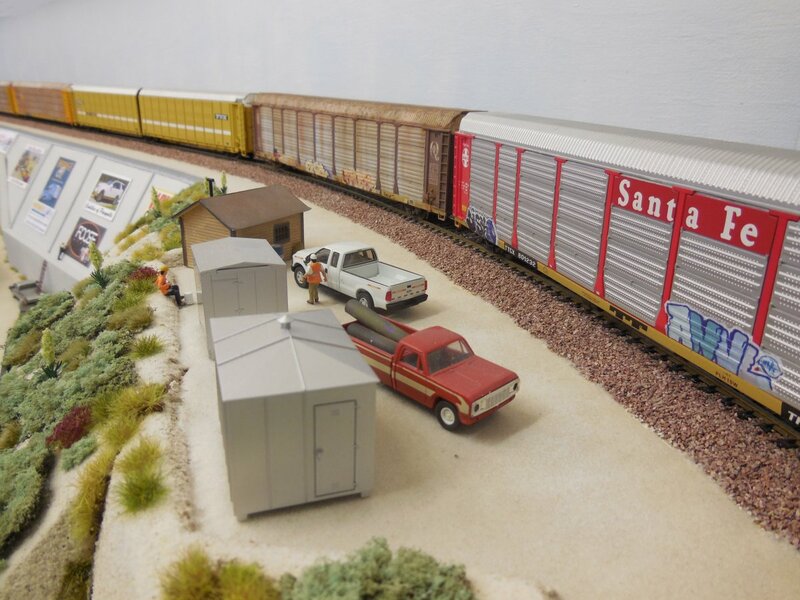 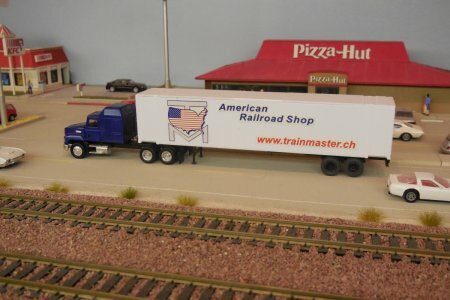 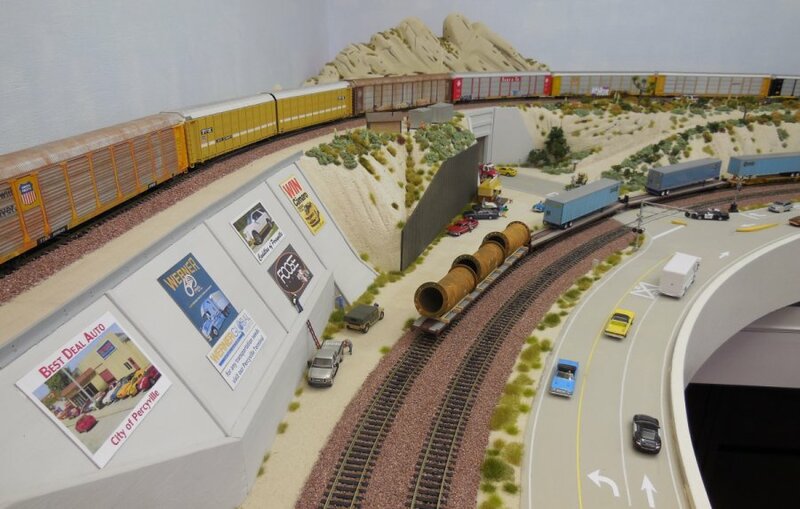 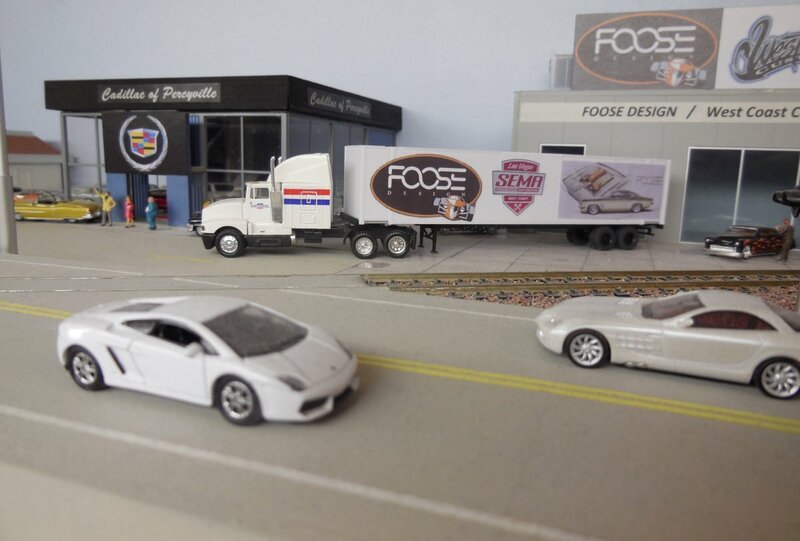 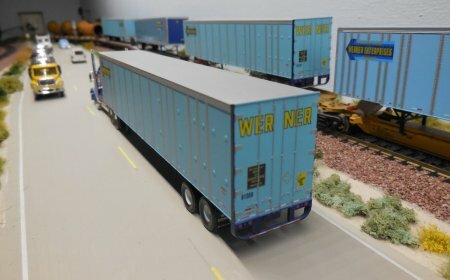 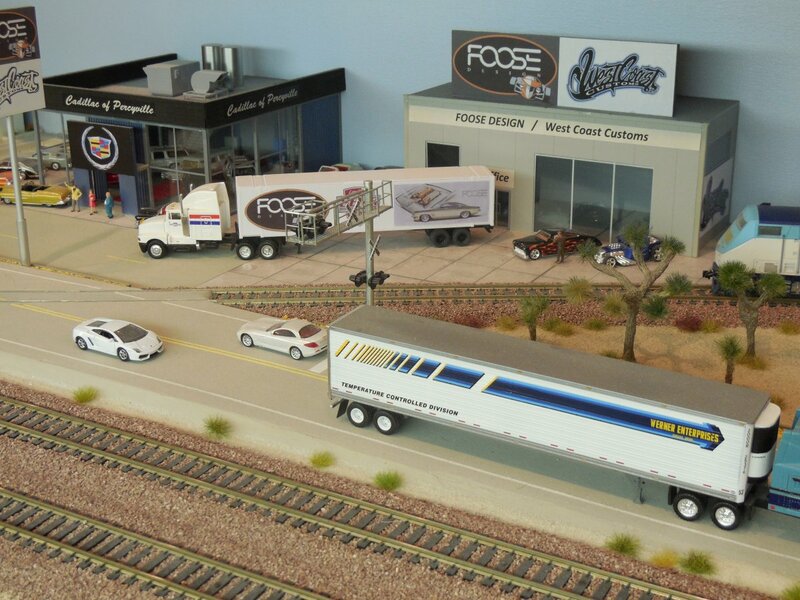 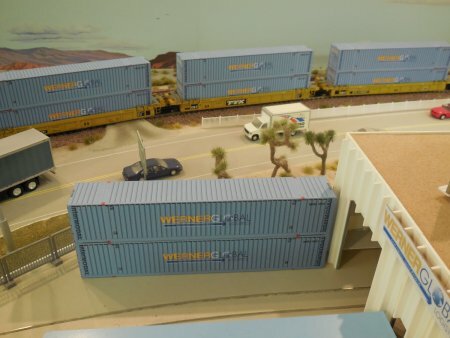 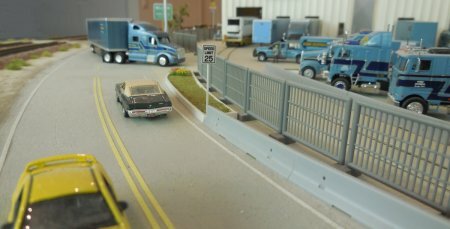 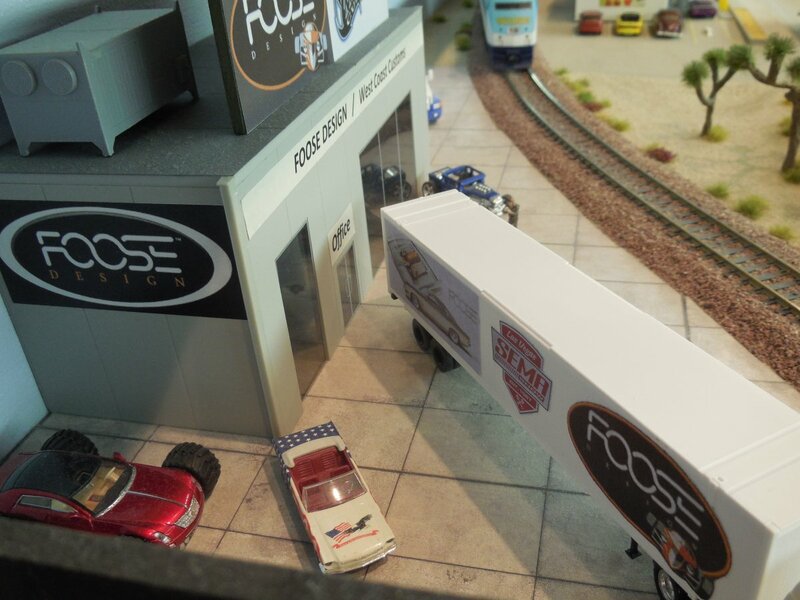 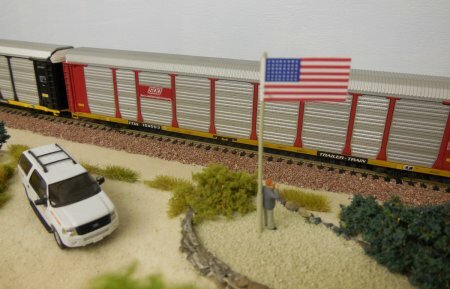 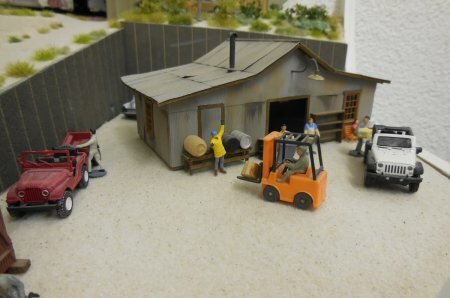 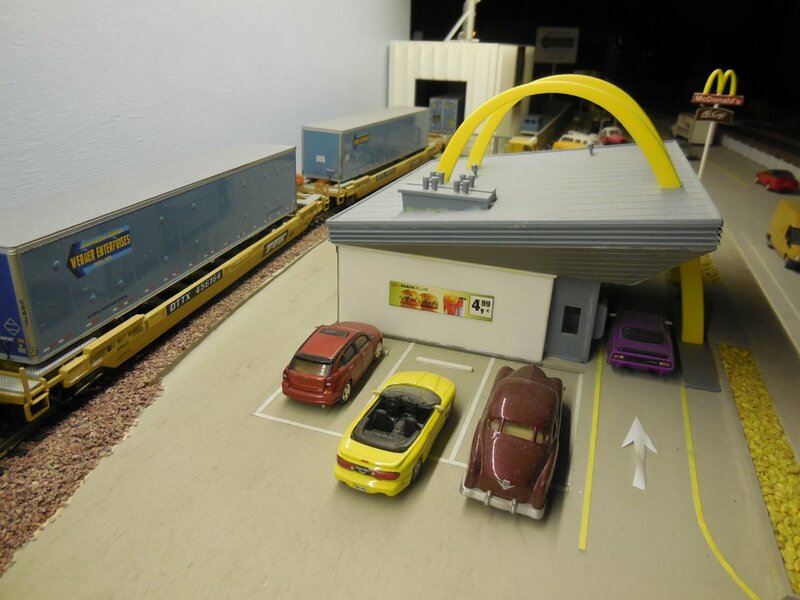 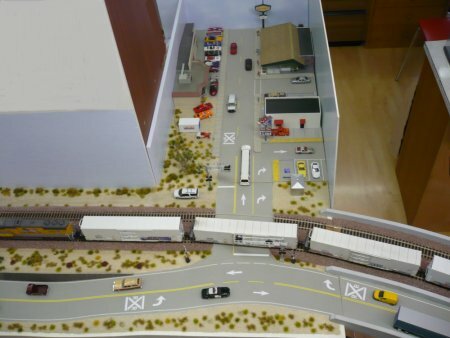 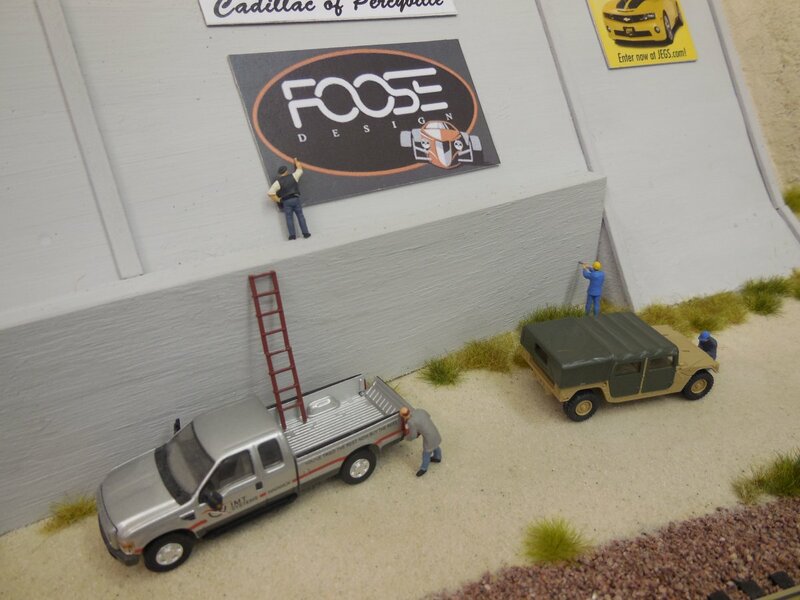 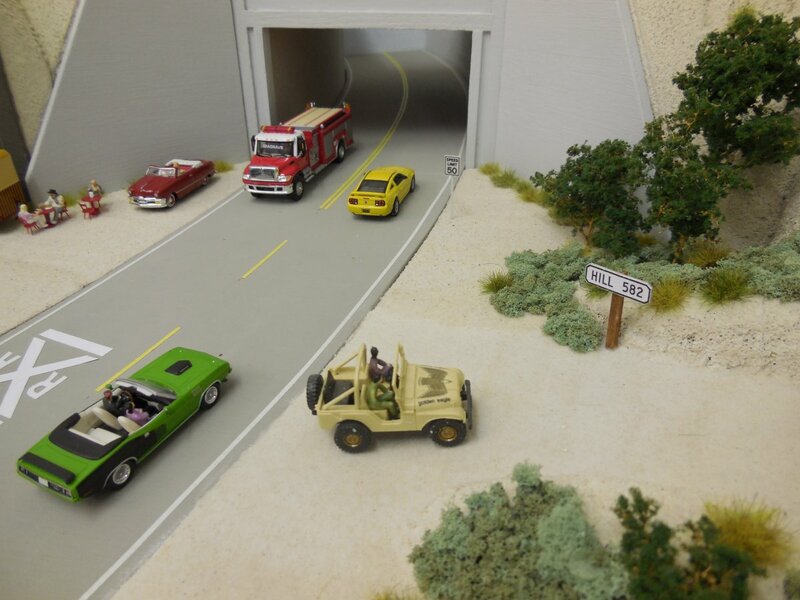 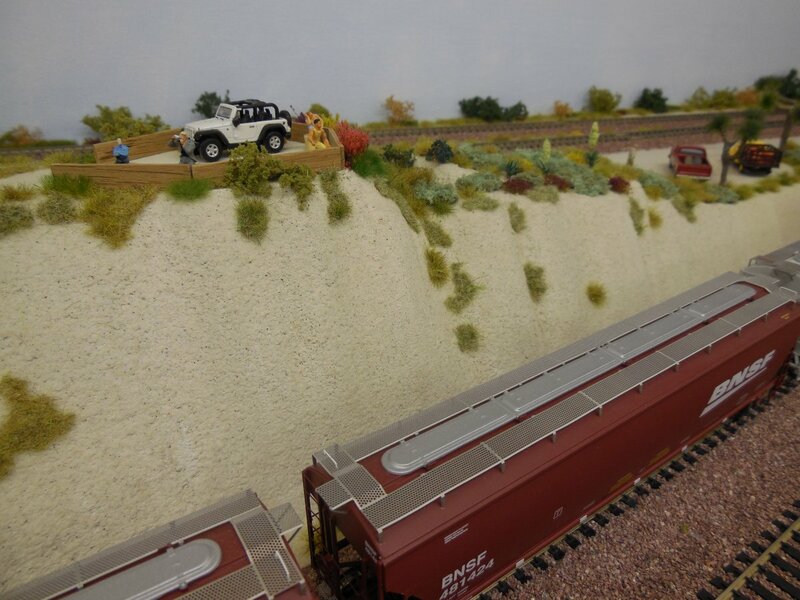 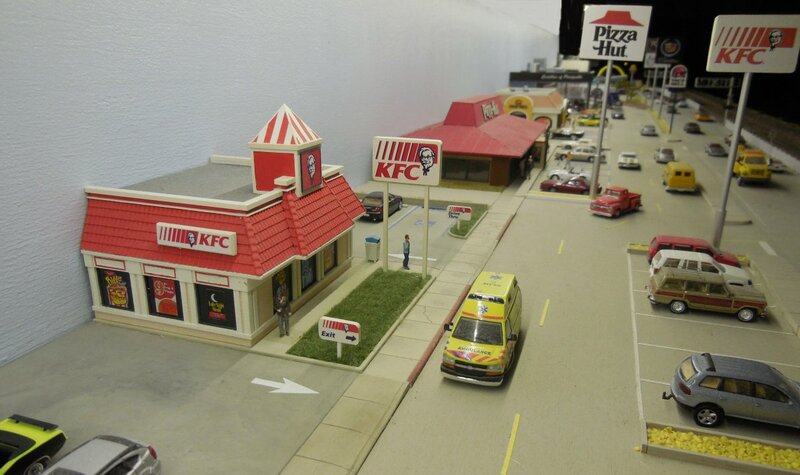 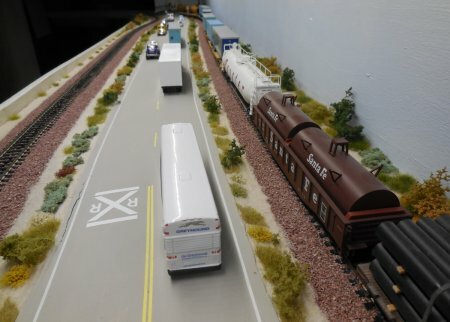 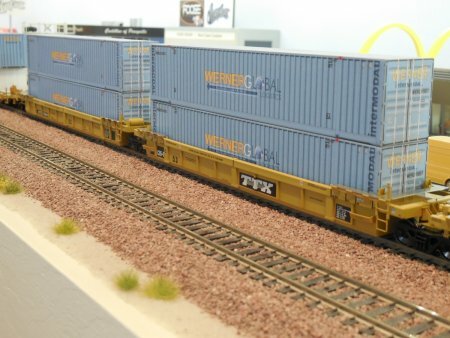 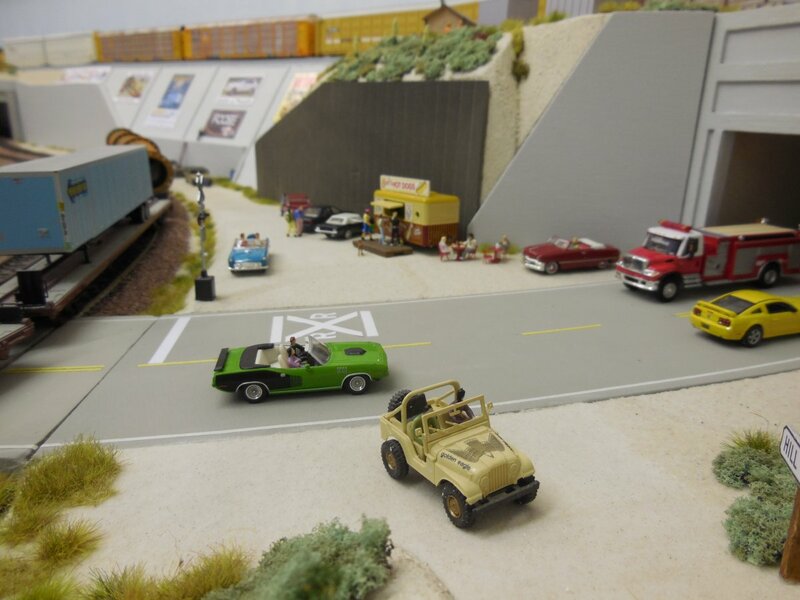 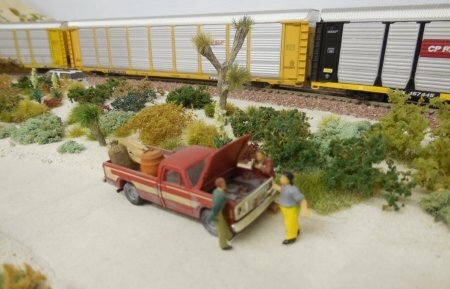 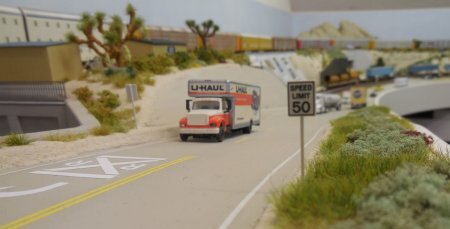 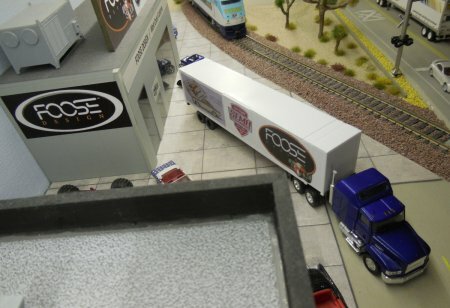 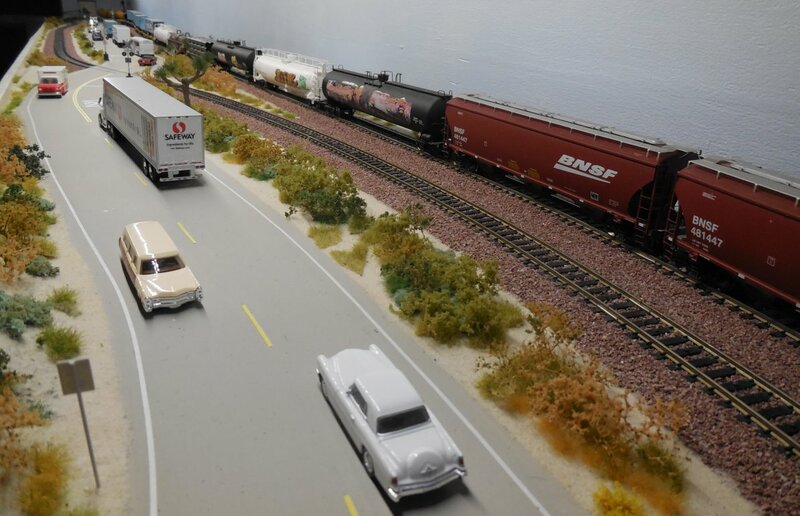 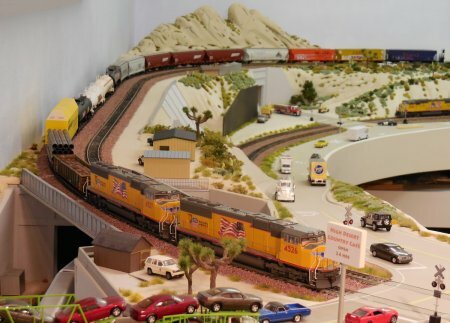 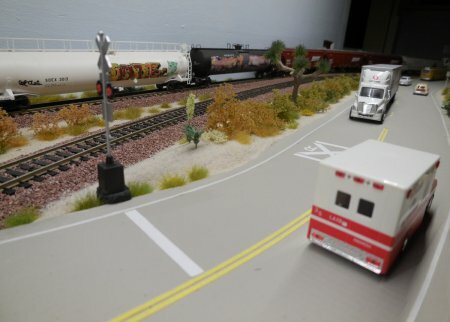 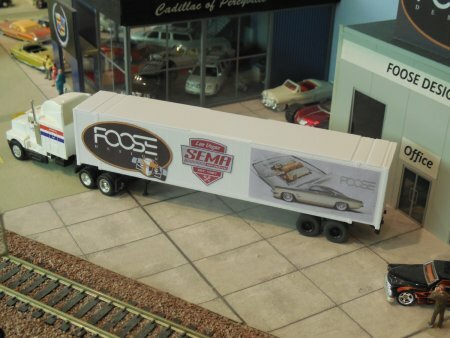 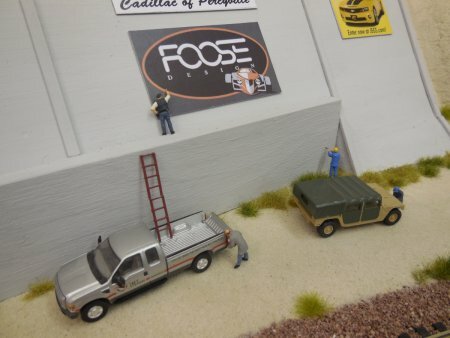 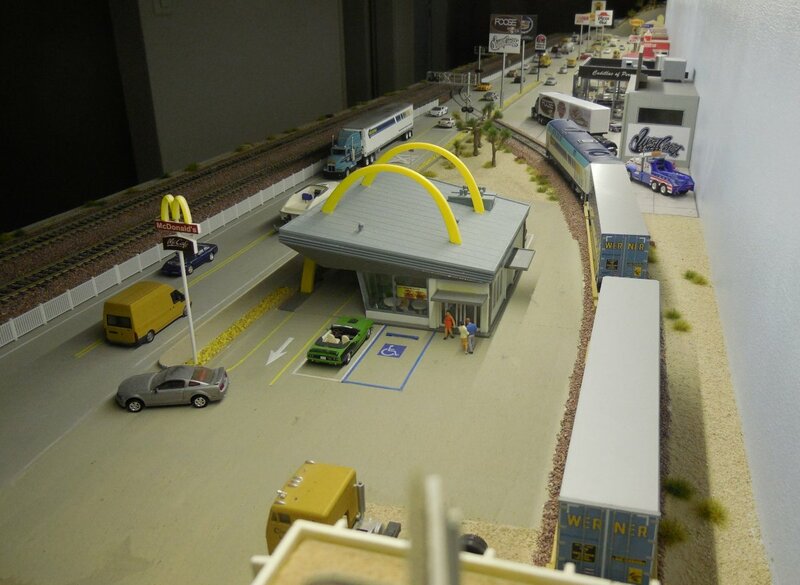 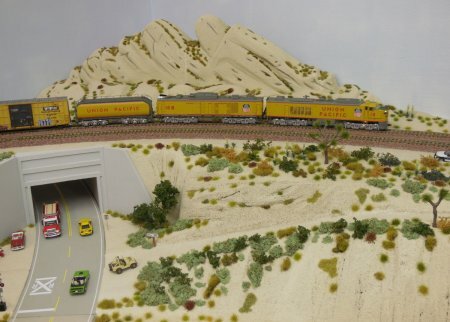 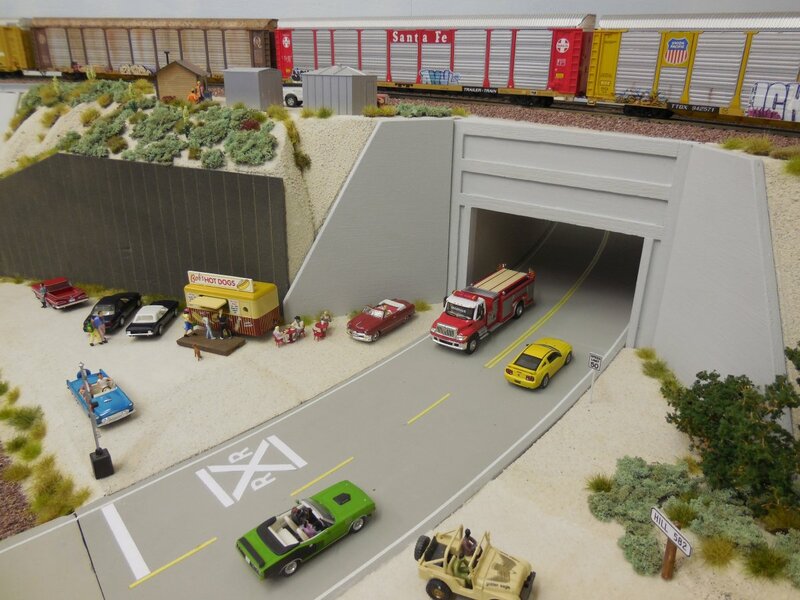 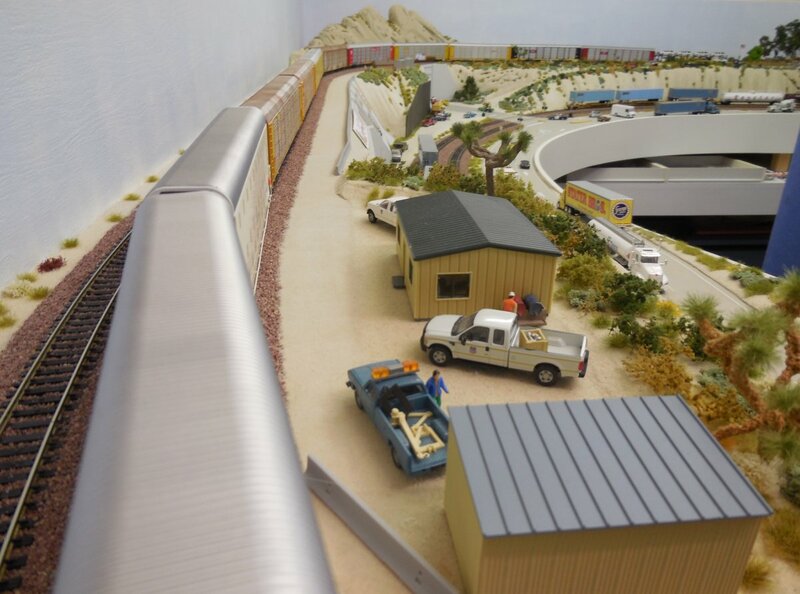 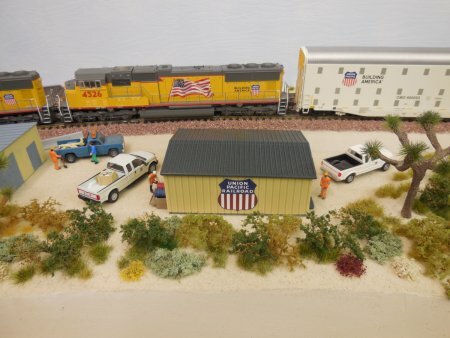 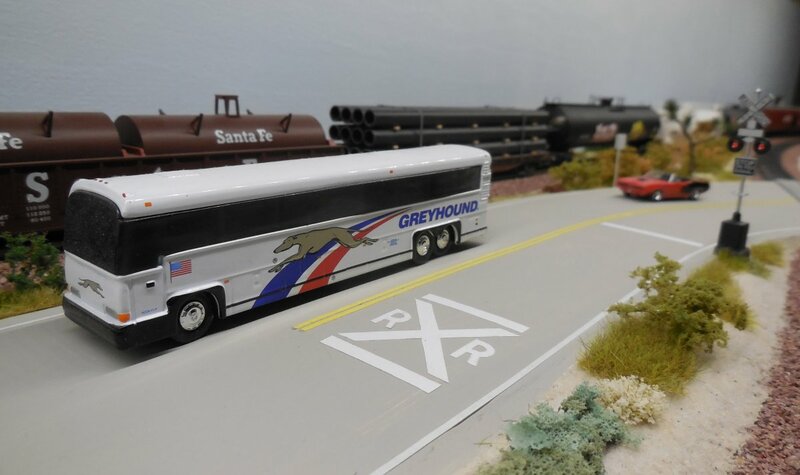 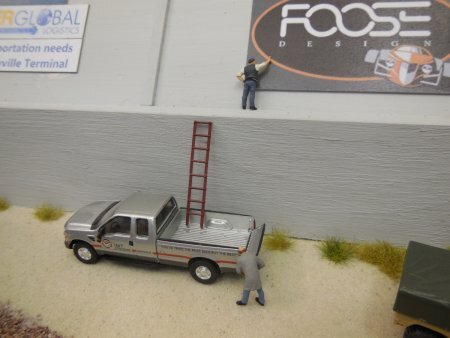 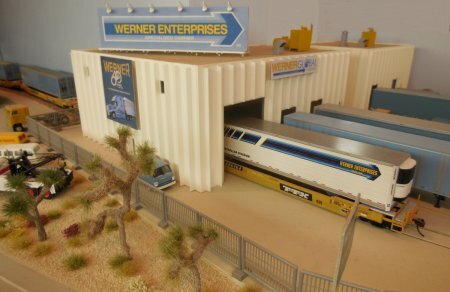 The layout is coming alive with lots of people at different places, plus Billboards, City signs, Road signs, special trailers for Foose Design and Trainmaster, etc. Some details have been added in March 2016 as you can see on this page. 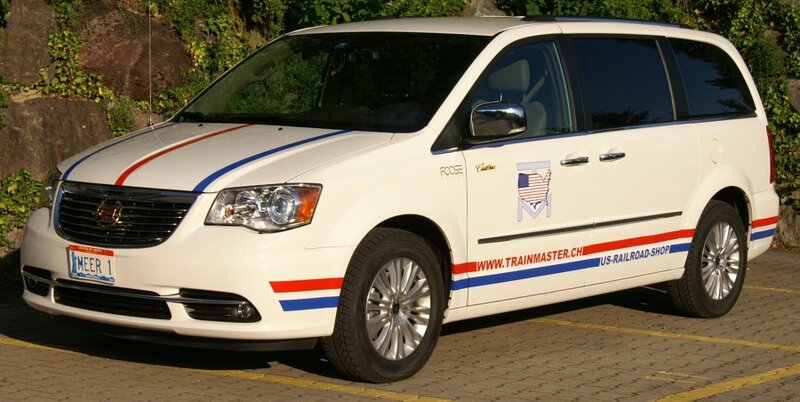 Most businesses are making promotion for their company, like restaurants, gas station, motel, car dealer, car designer, transportation etc. 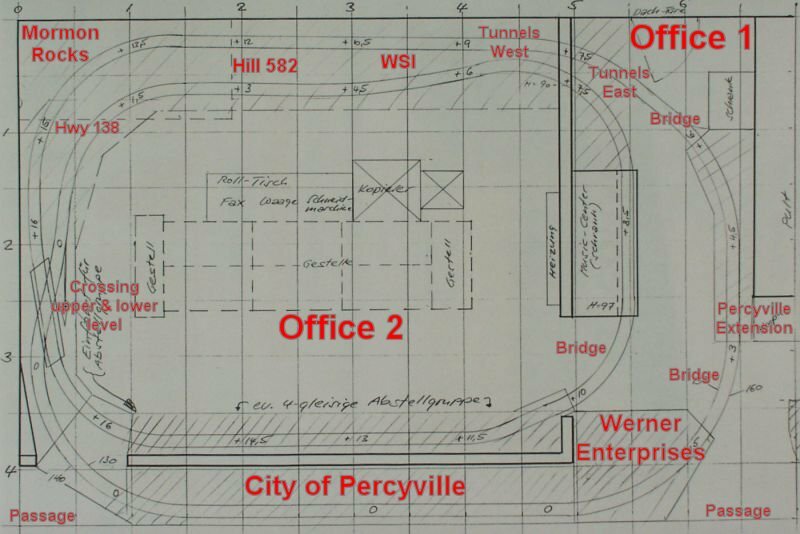 We are inside office 2 between the flyover and the Mormon Rocks. 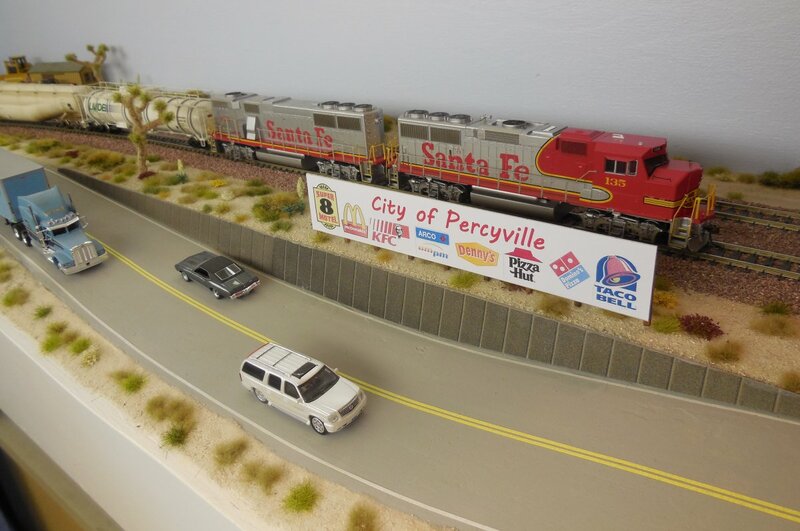 We are inside office 1 along Route 66 just before the Percyville Extension. 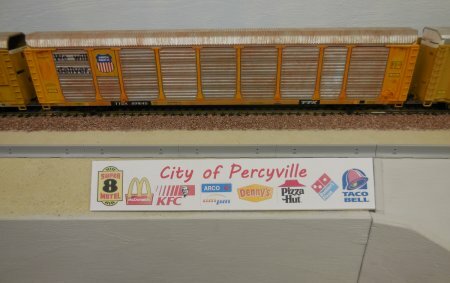 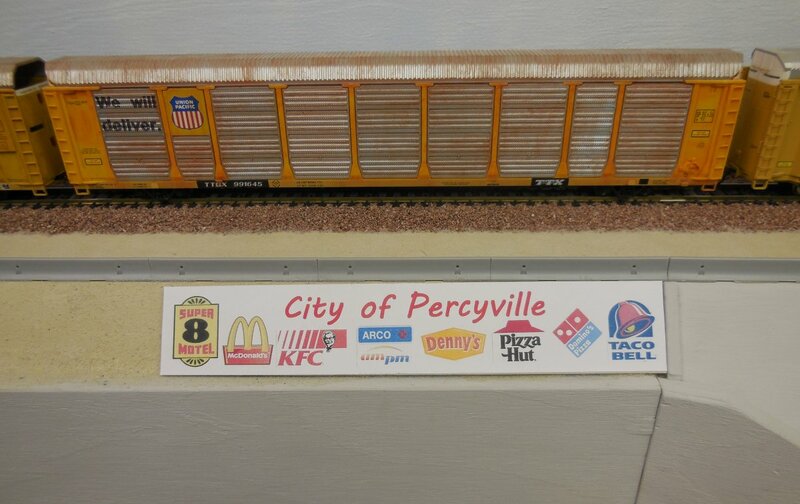 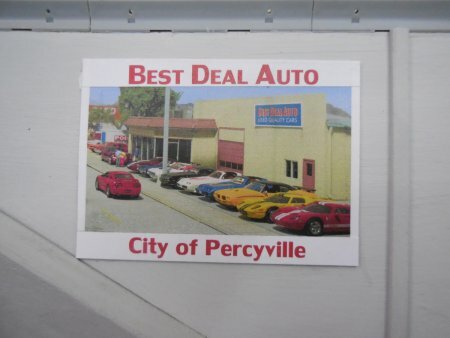 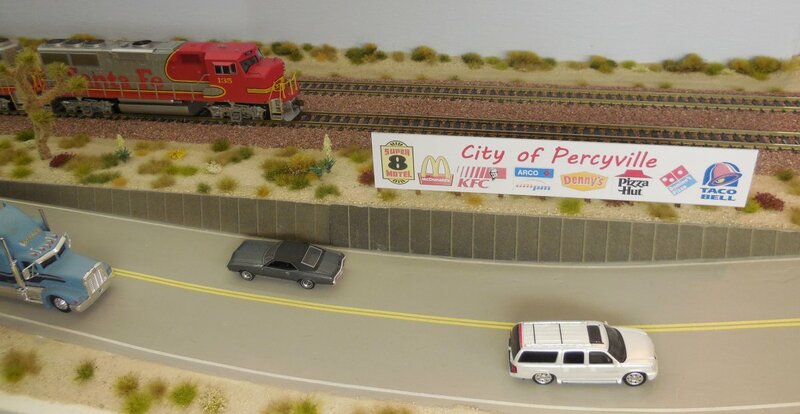 After all, the City of Percyville got their city sign on both sides. 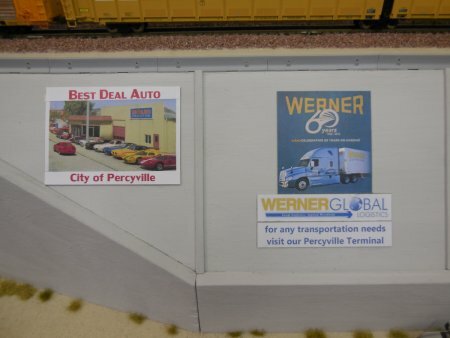 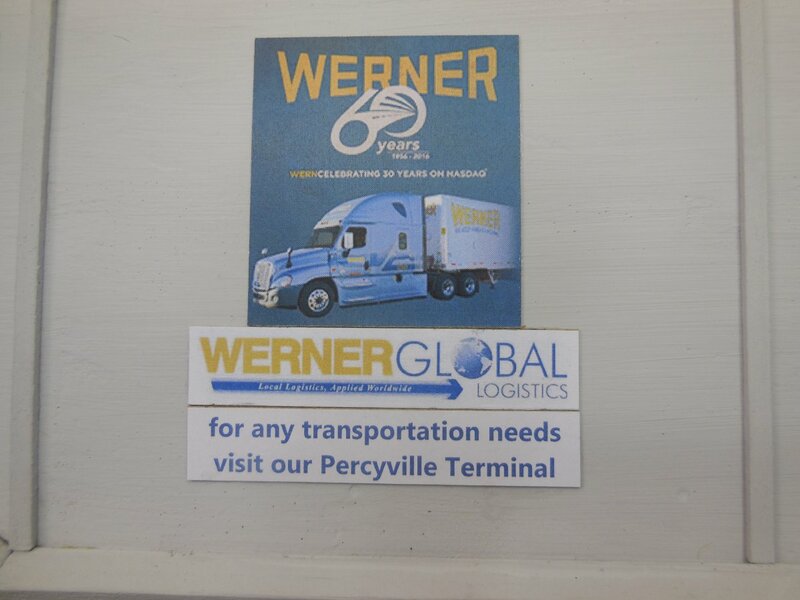 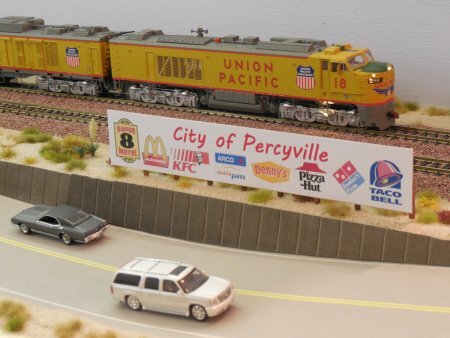 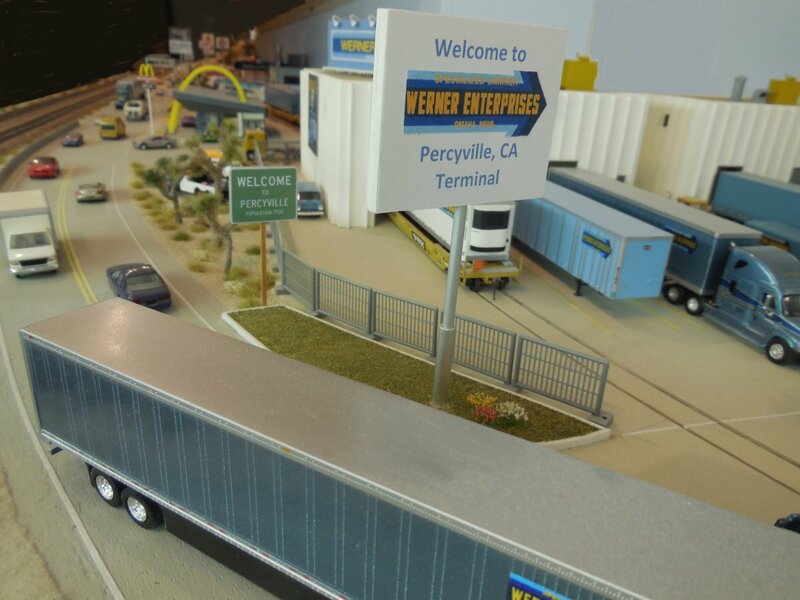 At the East side, next to the Werner Enterprises Terminal is the new City of Percyville sign. At the West side, the City of Percyville sign is at the left side of the road because there is not enough space between road and tracks. A 60 Years billboard was mounted on the front of the warehouse. 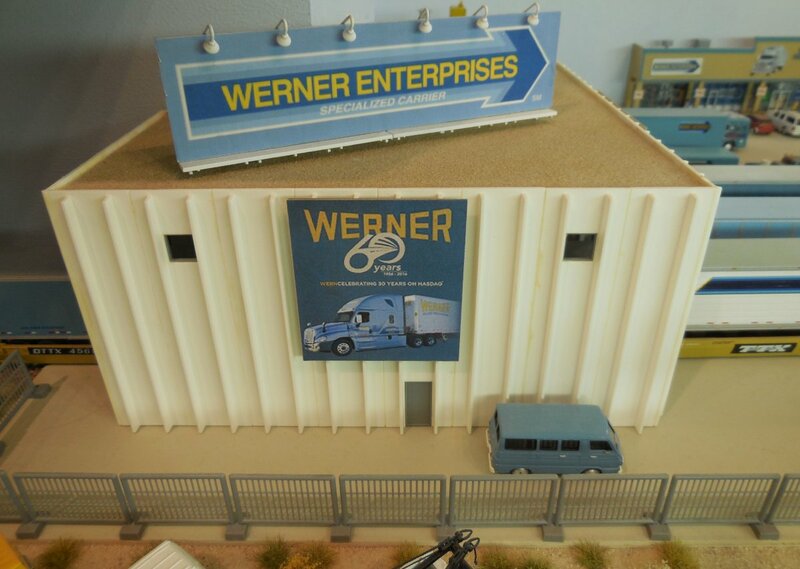 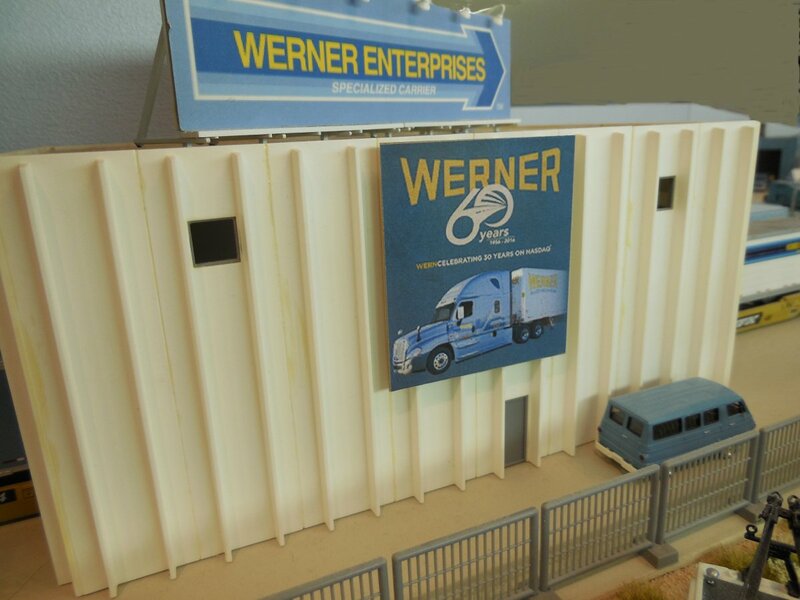 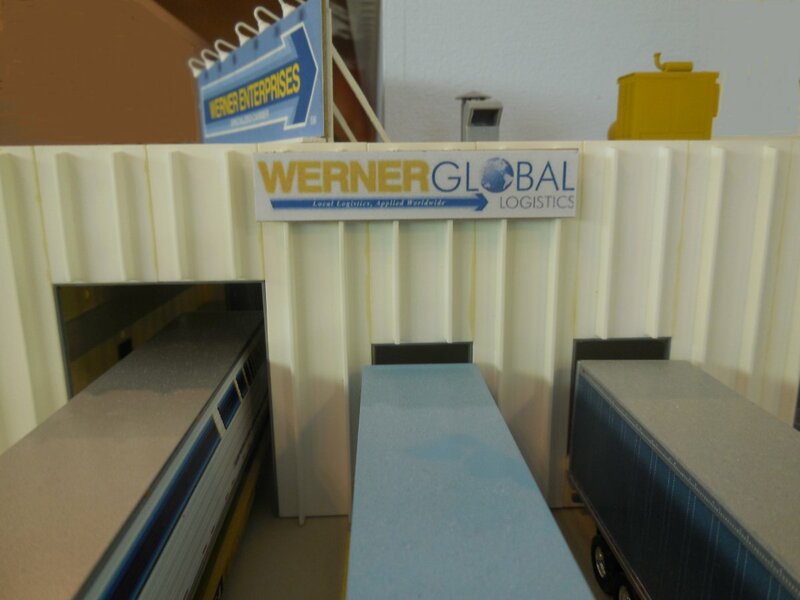 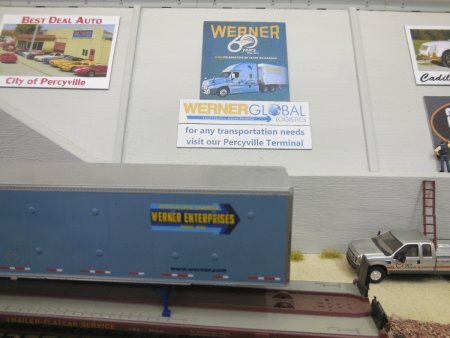 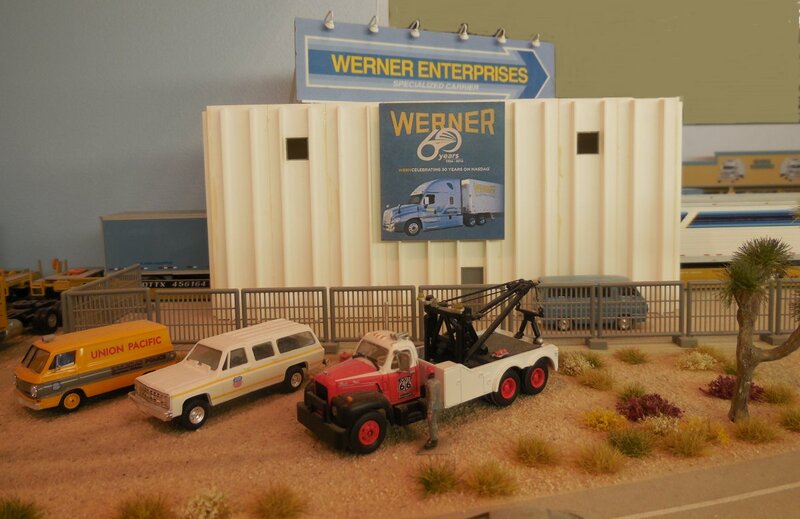 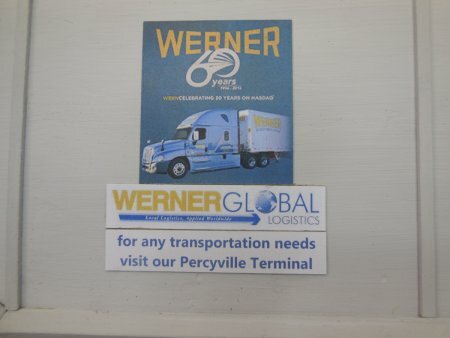 On the other side I mounted a Werner Global Logistics sign. 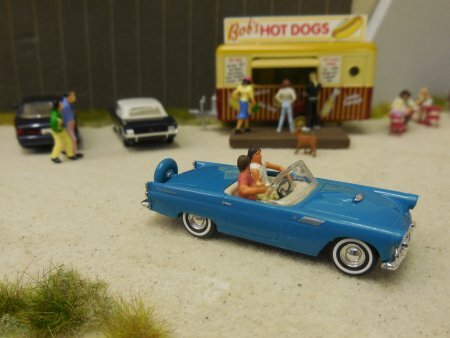 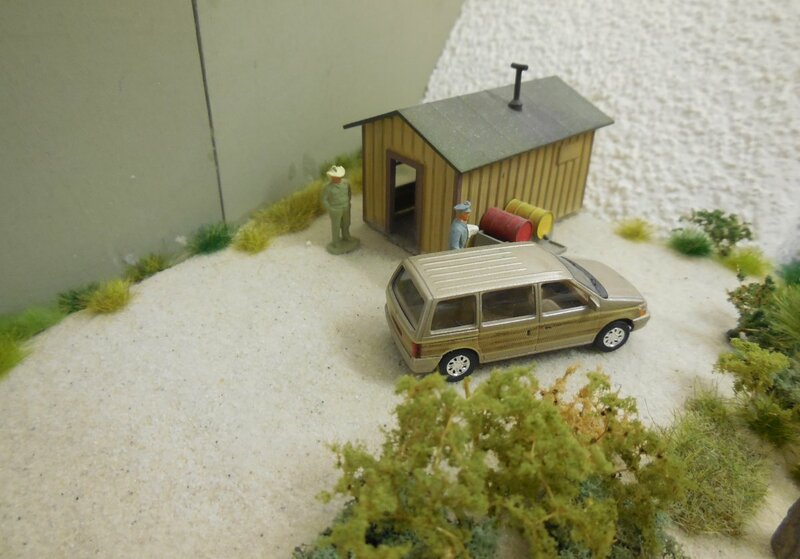 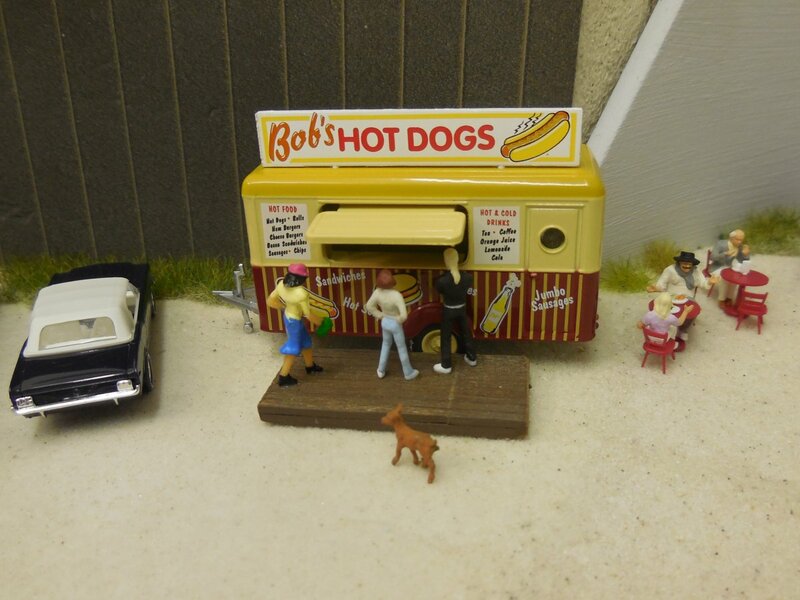 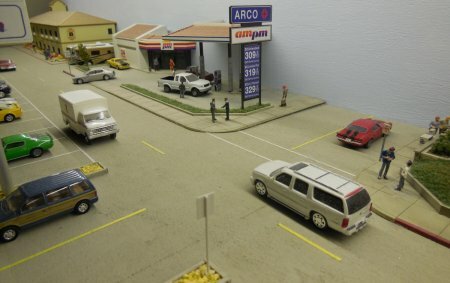 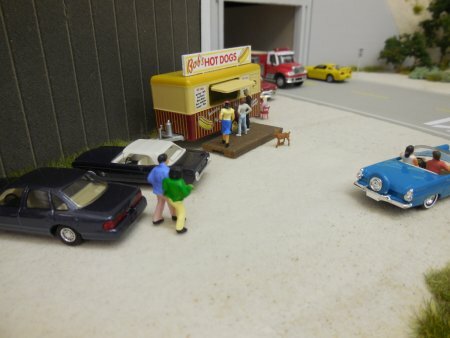 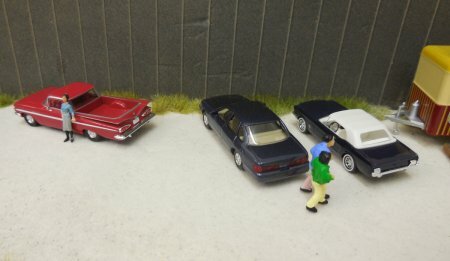 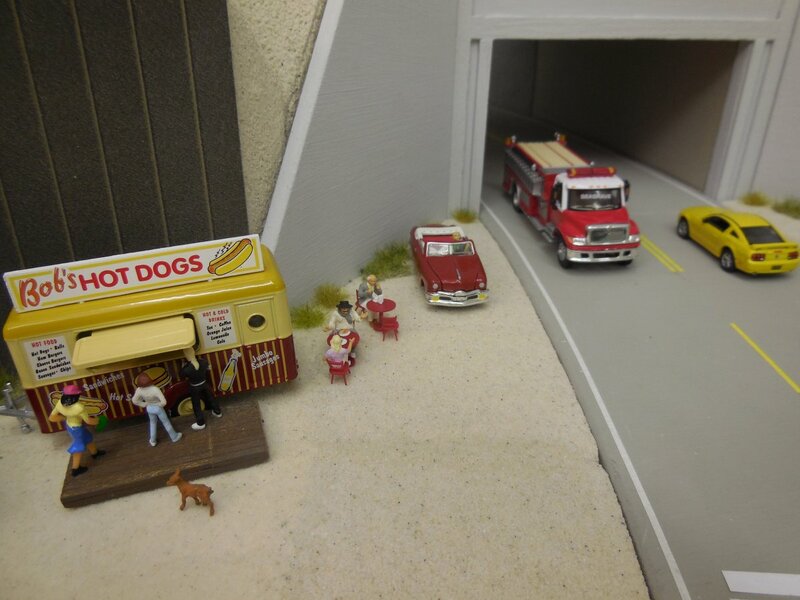 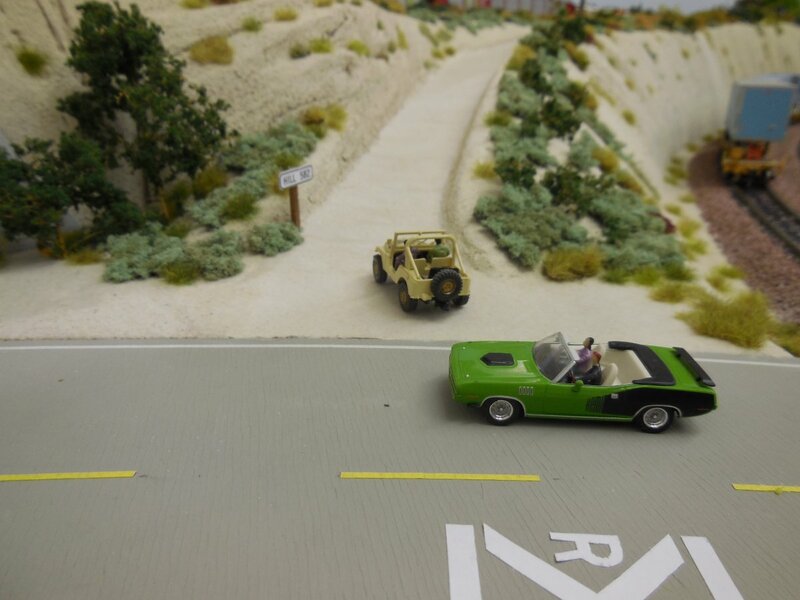 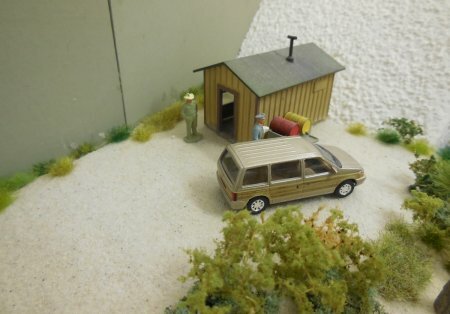 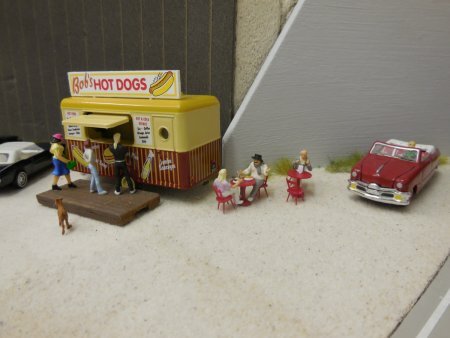 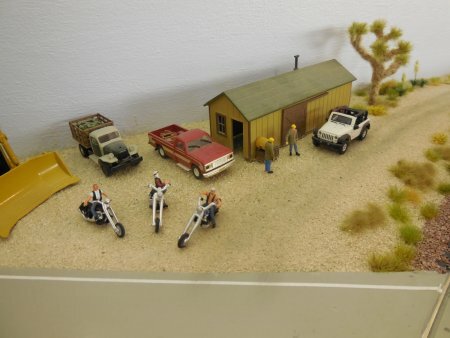 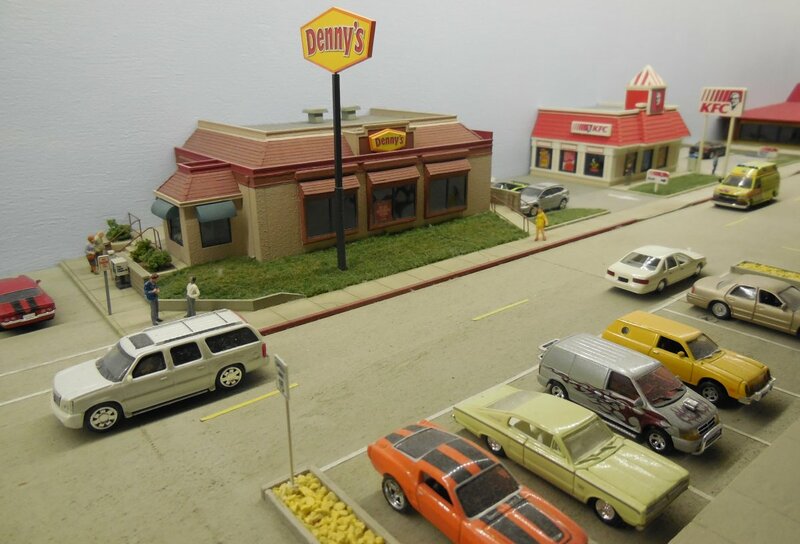 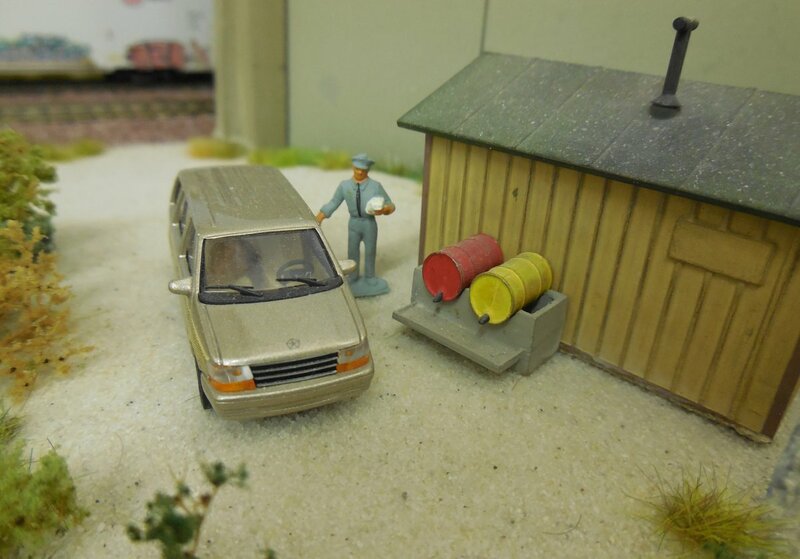 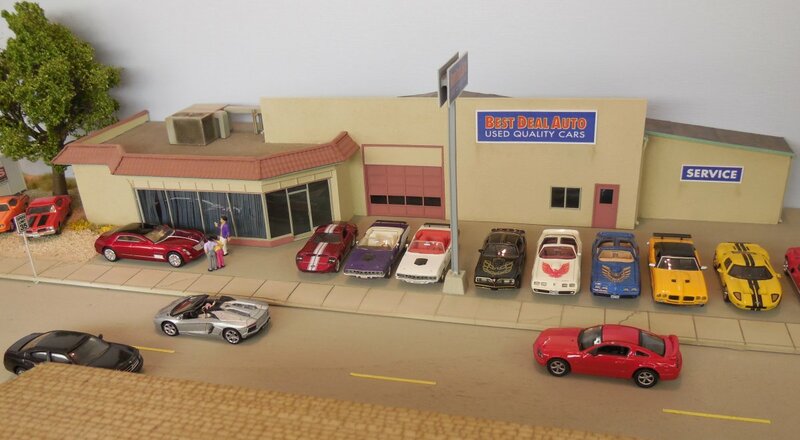 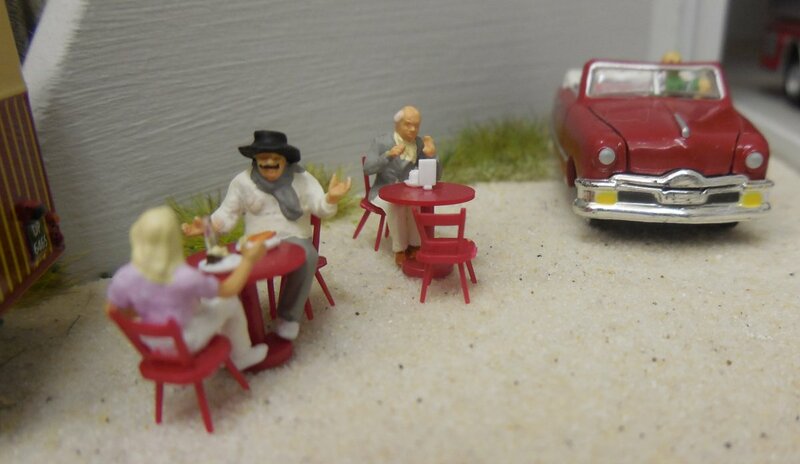 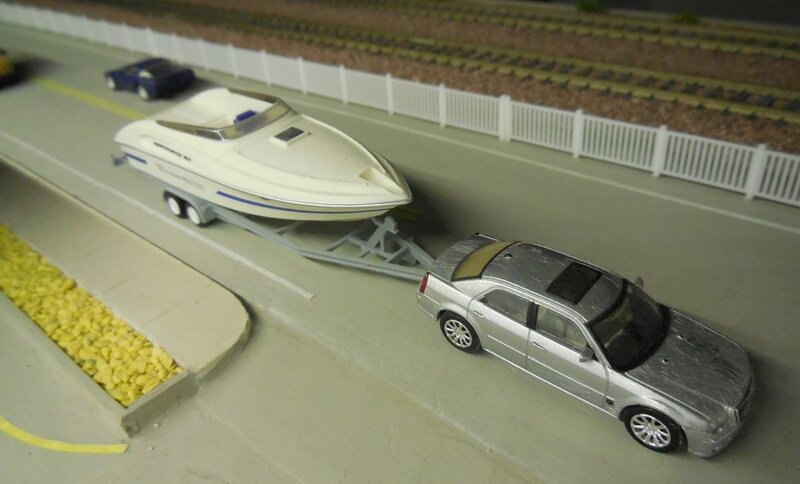 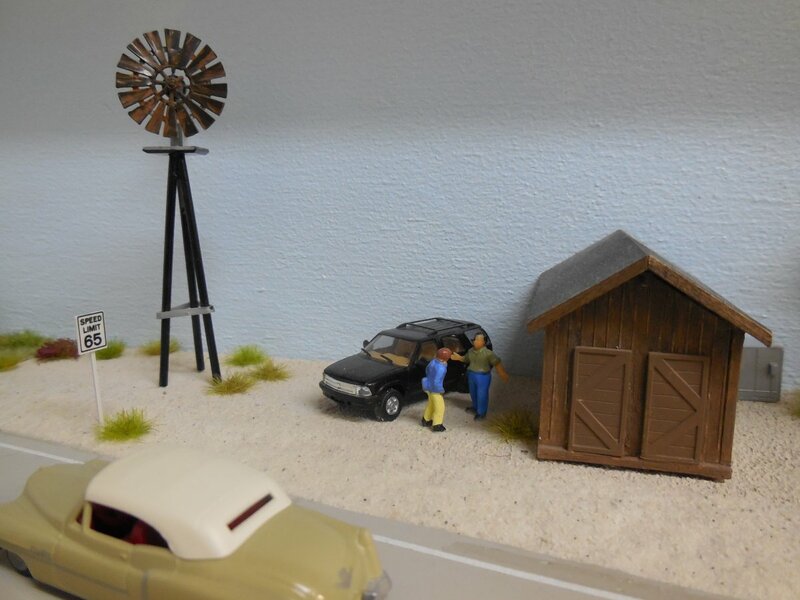 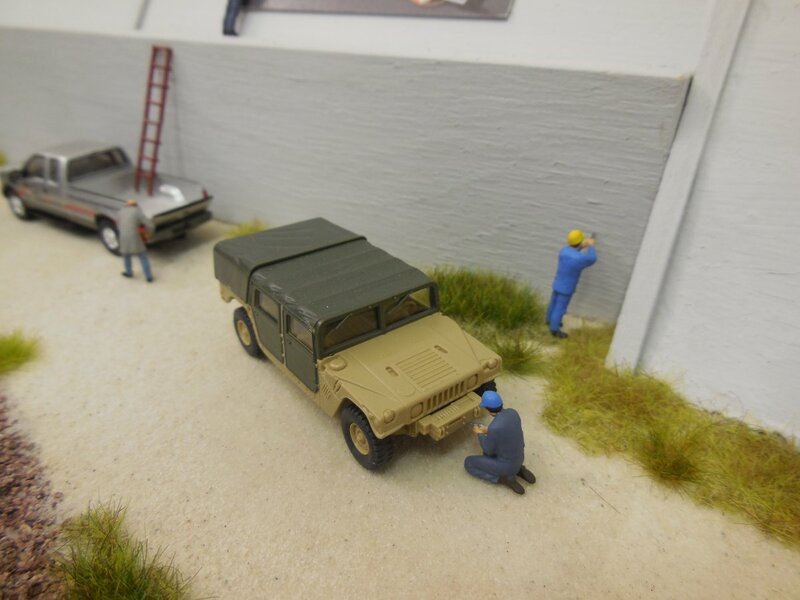 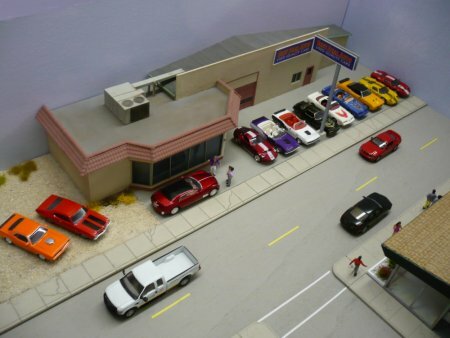 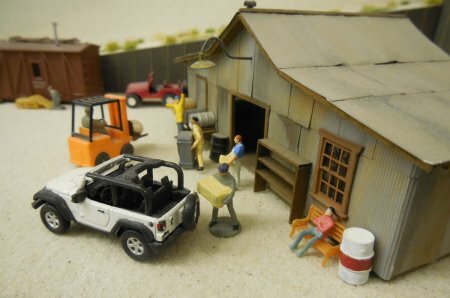 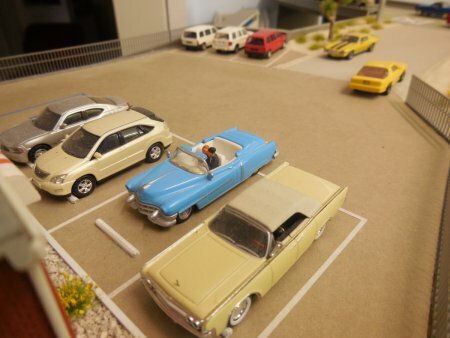 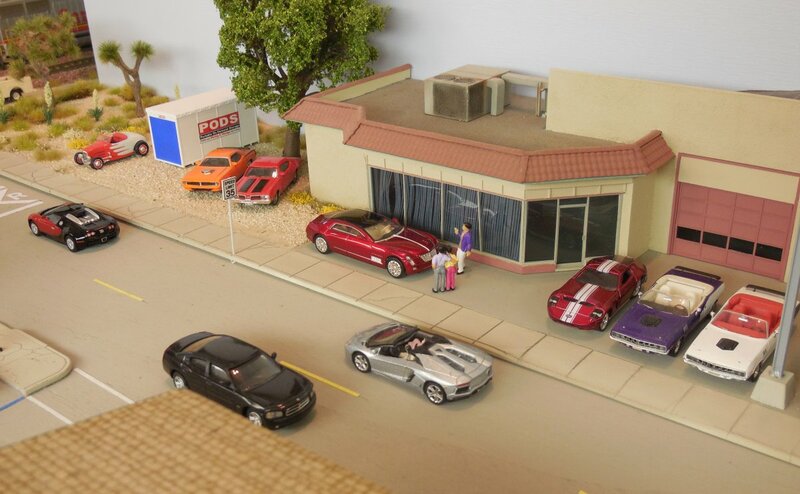 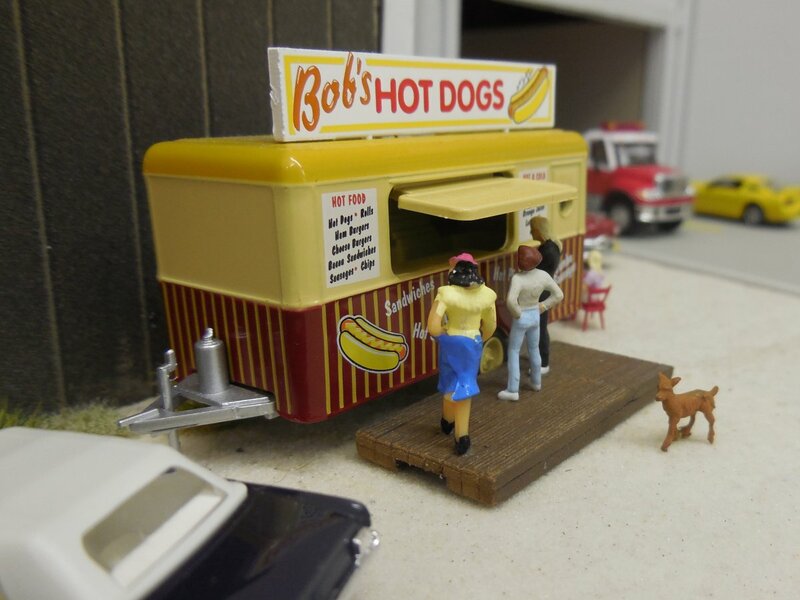 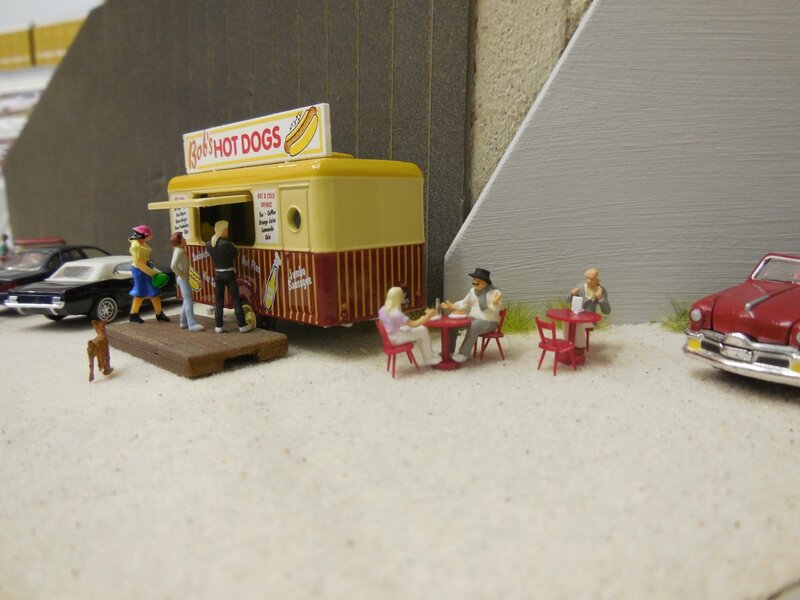 People and Vehicles bring a scene to life. 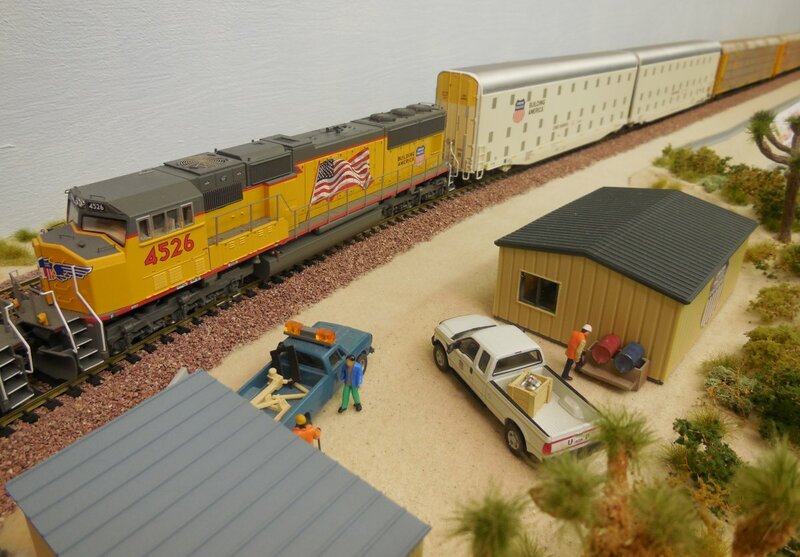 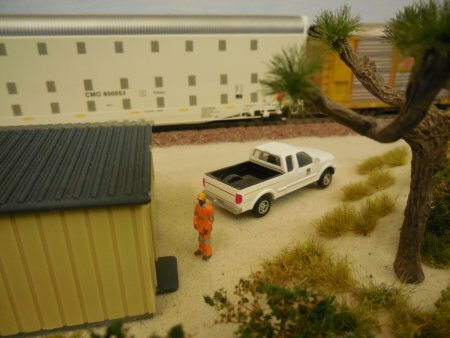 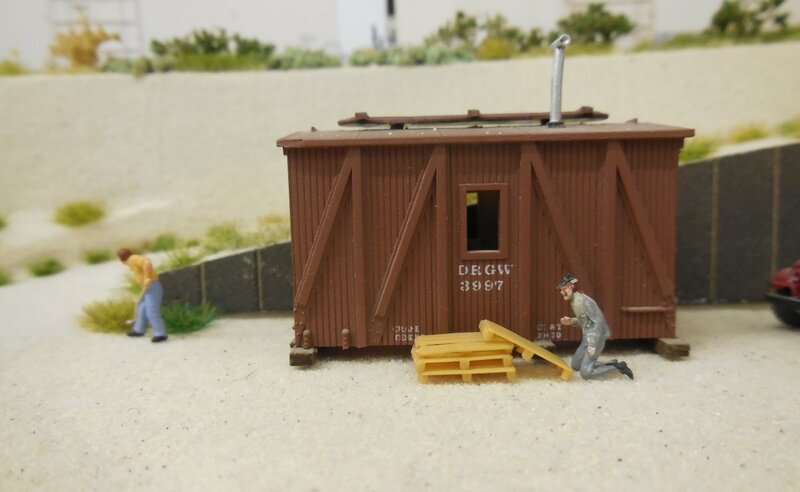 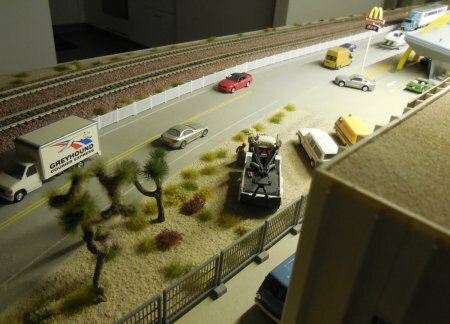 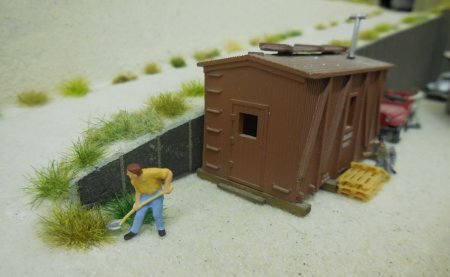 Near the flyover is a Union Pacific MoW (Maintenance of Way) office. 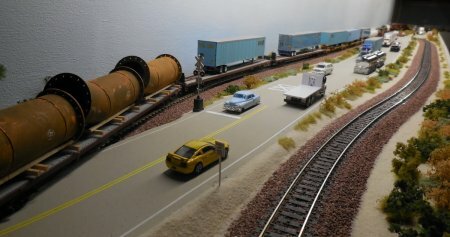 It can be reached on the BNSF service road along the upper main. 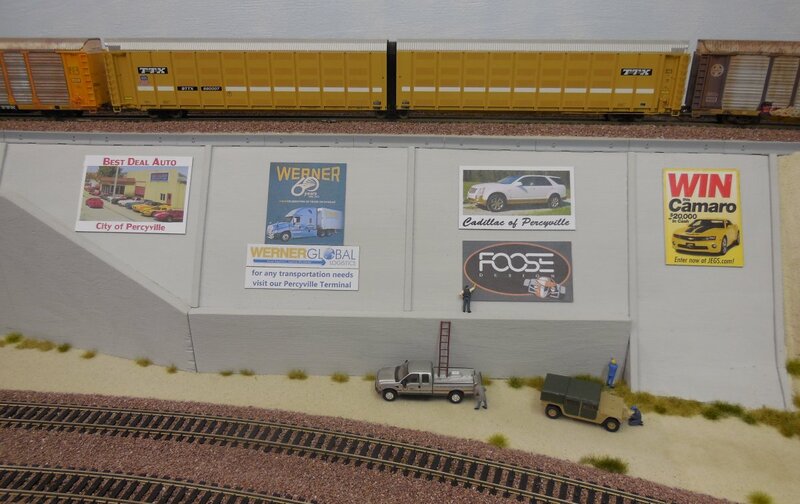 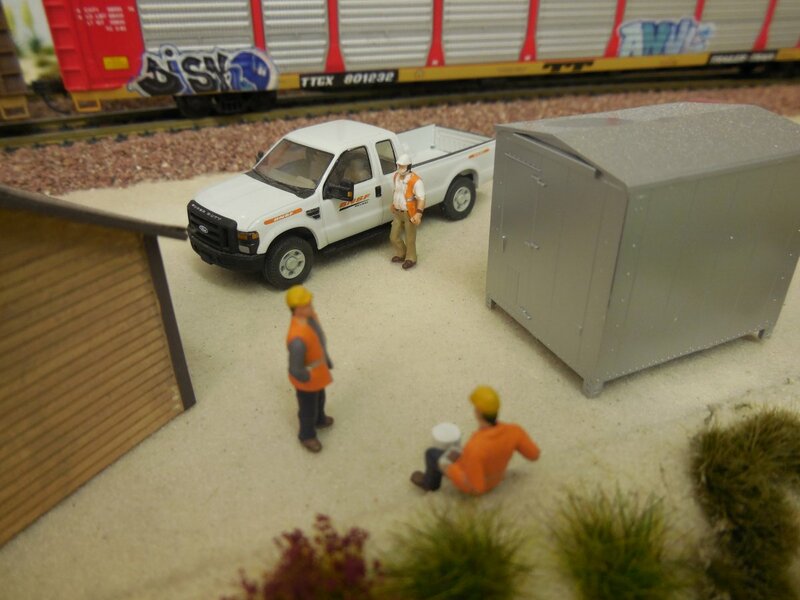 BNSF has a shed and 2 electrical boxes just above Highway 138 next to the Mormon Rocks. A special place for railfans to find some food and beverages near the Mormon Rocks or on the way to Sullivan's Curve or Hill 582. 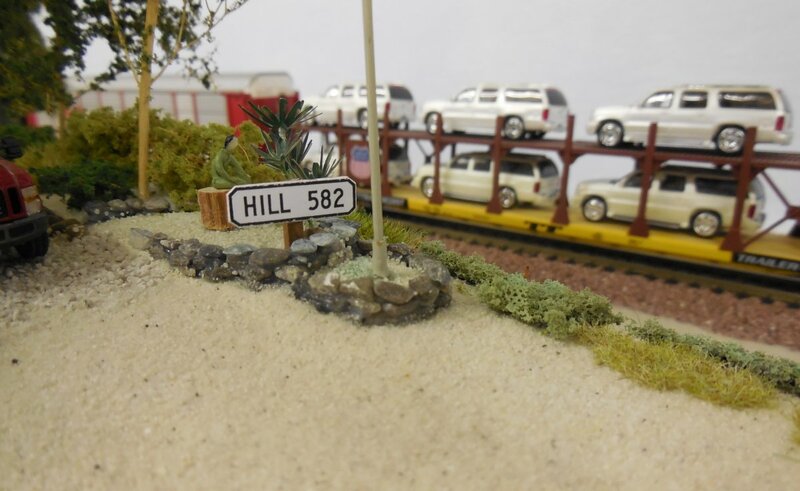 The access road to the BNSF service road and to Hill 582 and even WSI starts at Highway 138. So far, Percyville was not very well lighted because of the shadow made by the show cases above. 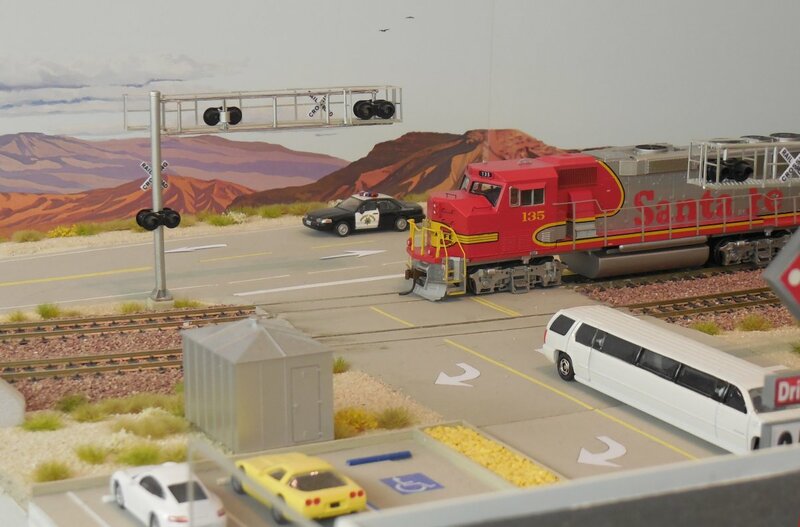 In addition, there is another advantage because I can just light the LED's below the show case and the City is well lighted to get a nice view w/o turning on the spots on the ceiling. 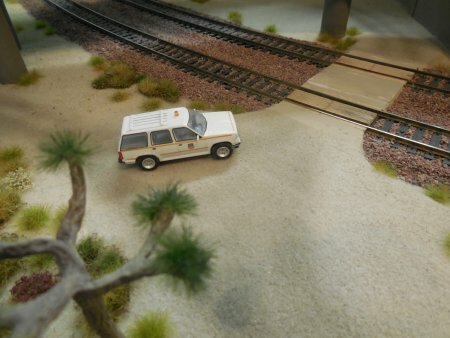 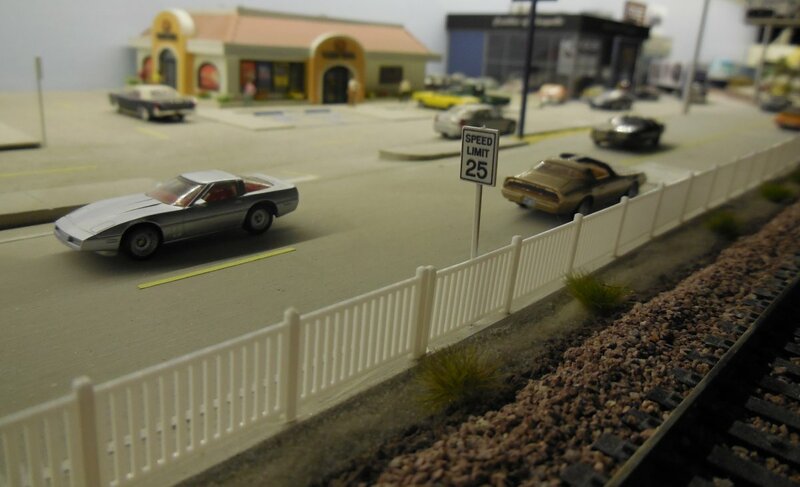 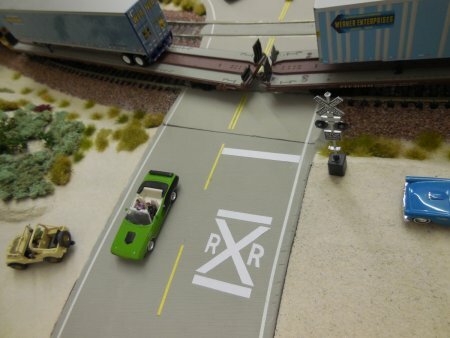 As the mainstreet is very close to the RR tracks, there should be either guard rails or a fence in between. 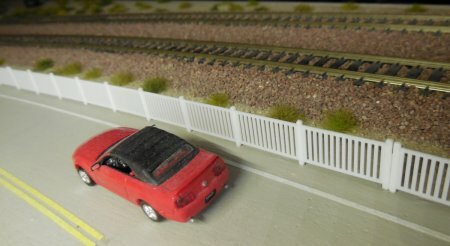 So, I decided to mount a white fence along mainstreet. 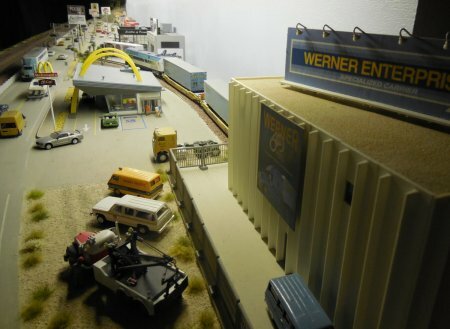 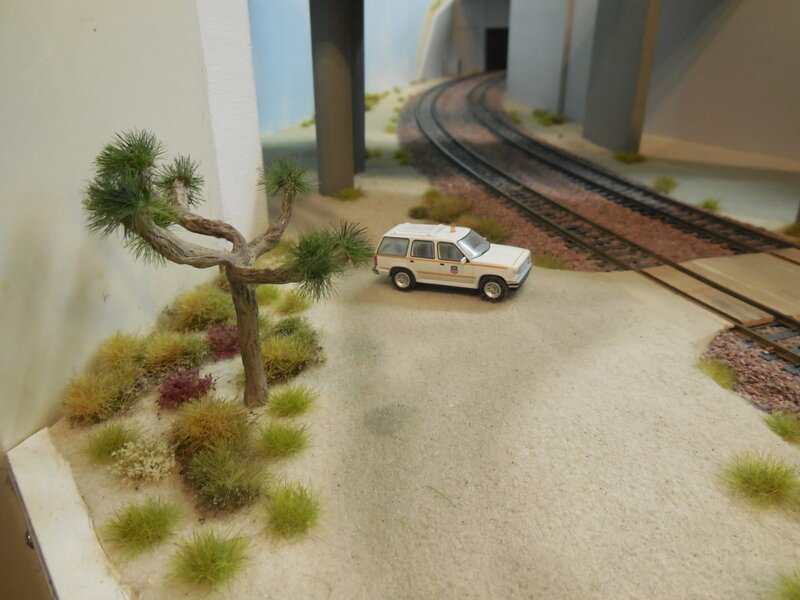 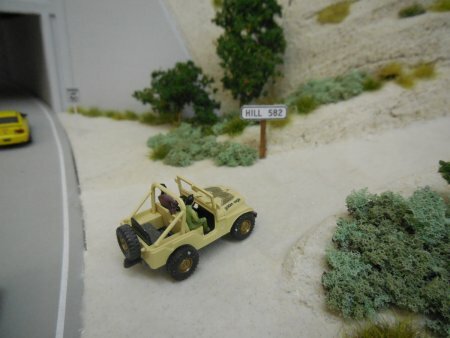 As the part with Route 66 between main track 1 and 2 is located in a shelf, the shelf board above is giving a shadow. 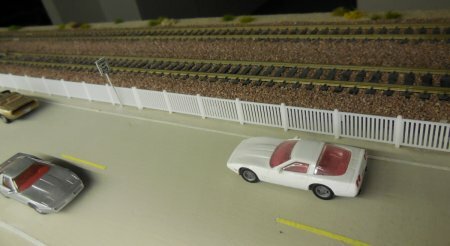 Therefore, I mounted a LED band under the board for better lighting.